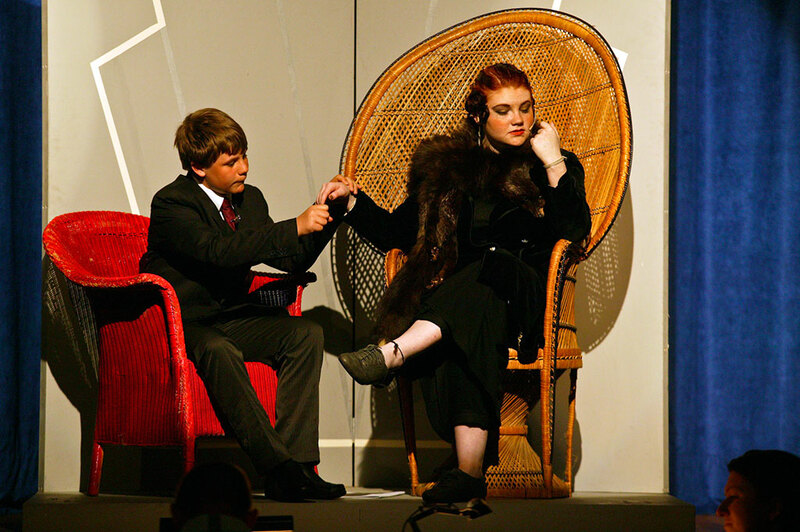 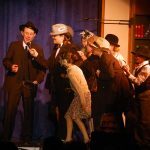 Drama provides students with the opportunity to develop their communication and problem solving skills while increasing an understanding of themselves and those around them through practical activity. 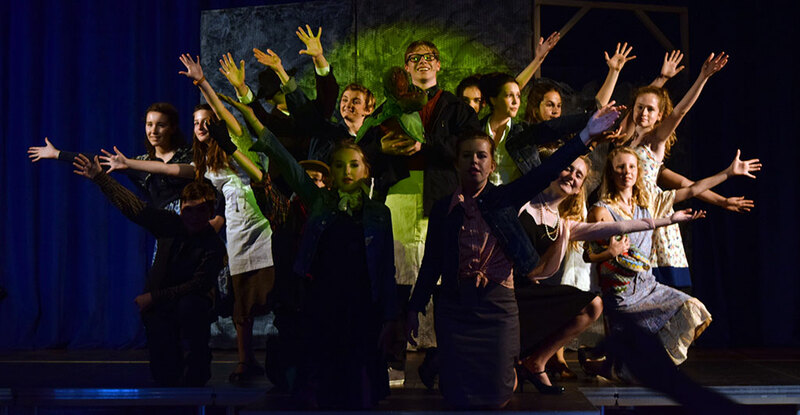 At Woodroffe we believe passionately in the value of drama for all, not just those who want to pursue a career in the performing arts. 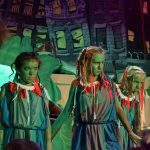 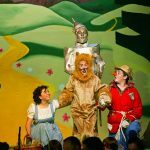 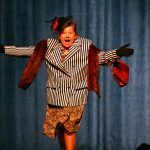 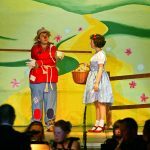 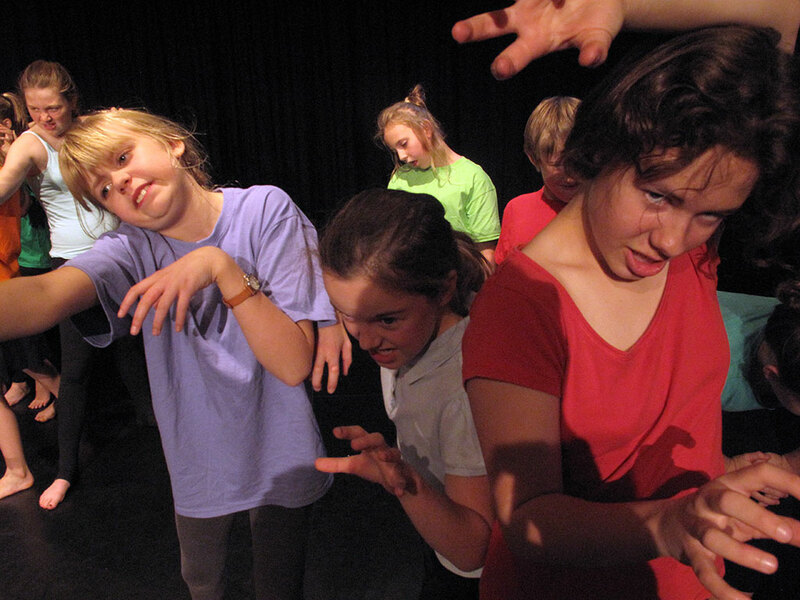 The skills acquired and developed in drama lessons are both subject specific and life skills, sometimes referred to as ‘transferable skills’. 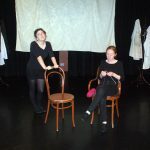 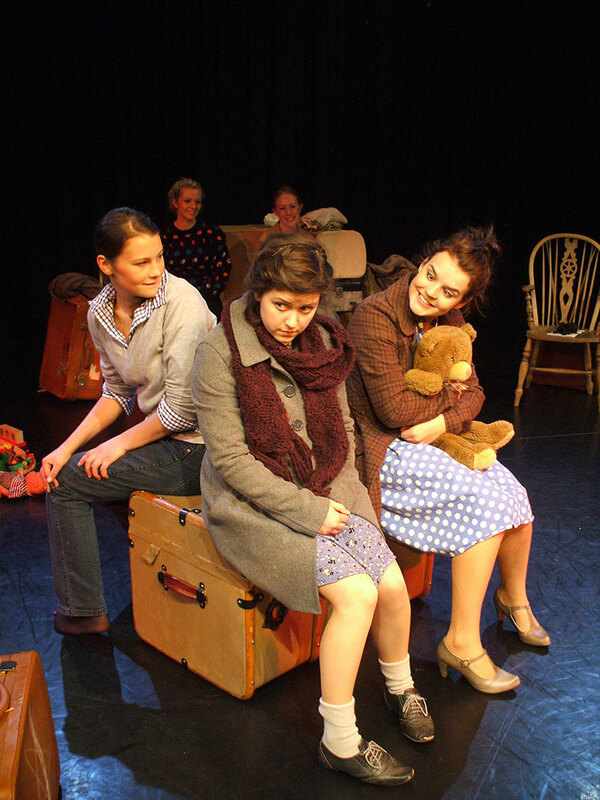 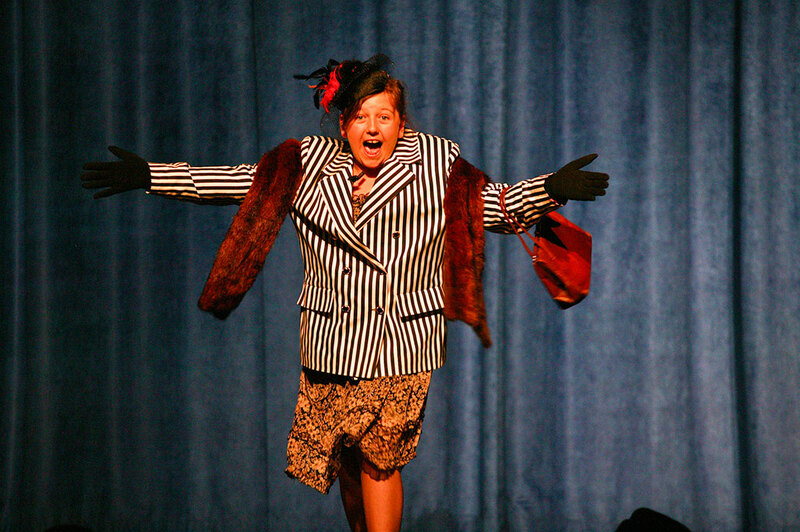 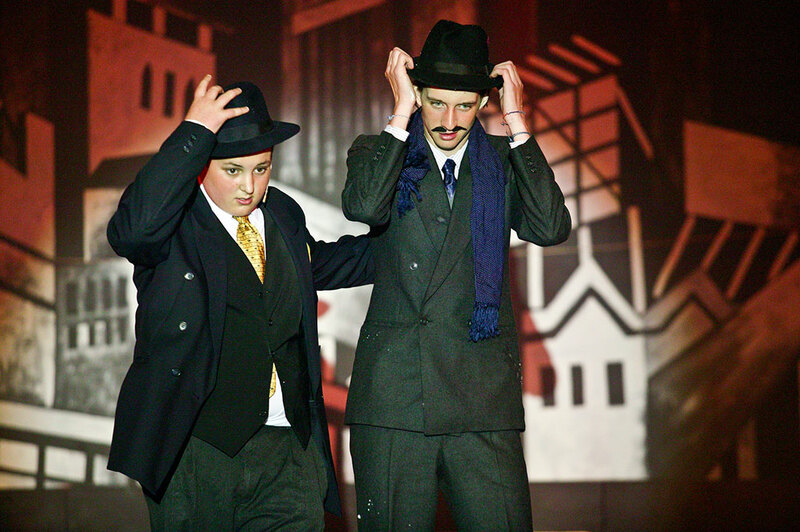 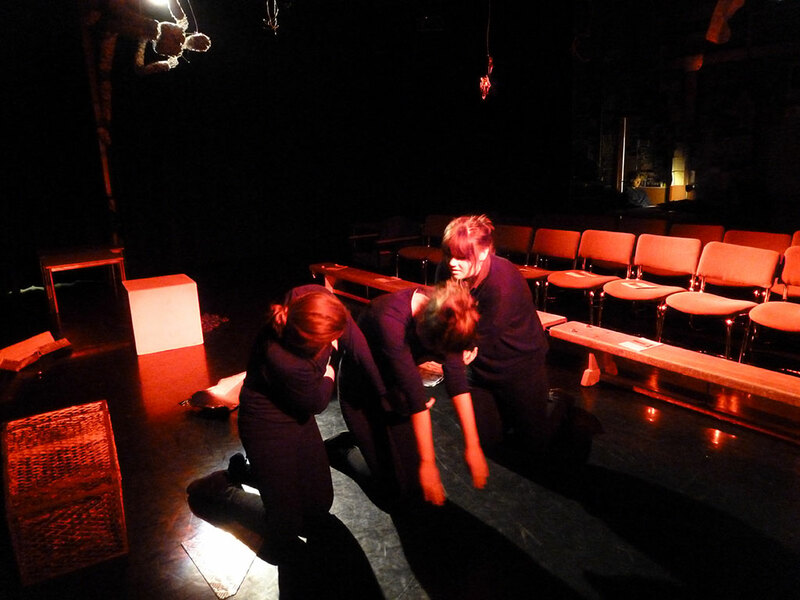 We also aim to build an appreciation of drama and theatre performance and its social, cultural and historical context. 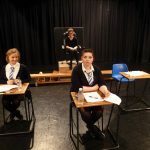 opportunity to self and peer assess, most lessons involve whole class and group discussion, group work, sharing of practical work and evaluation of some kind. 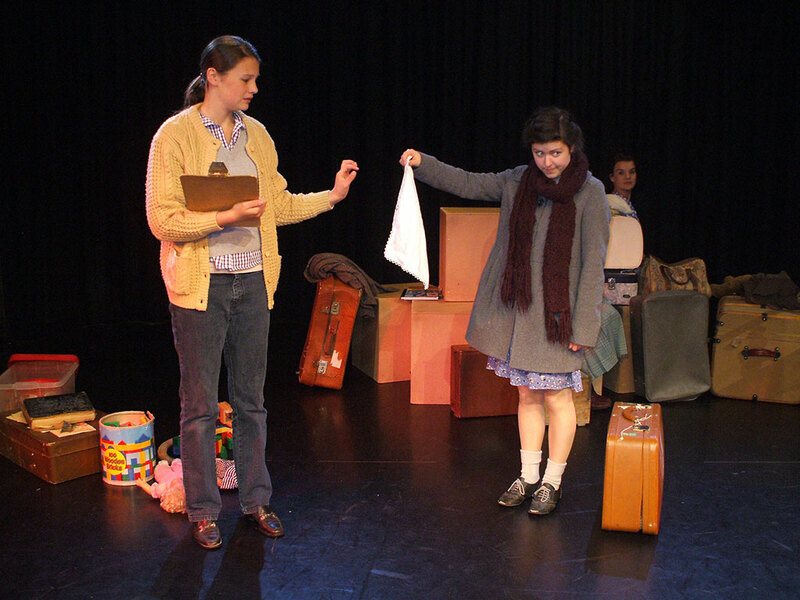 Students are given feedback that set appropriate targets and give them next steps to take. 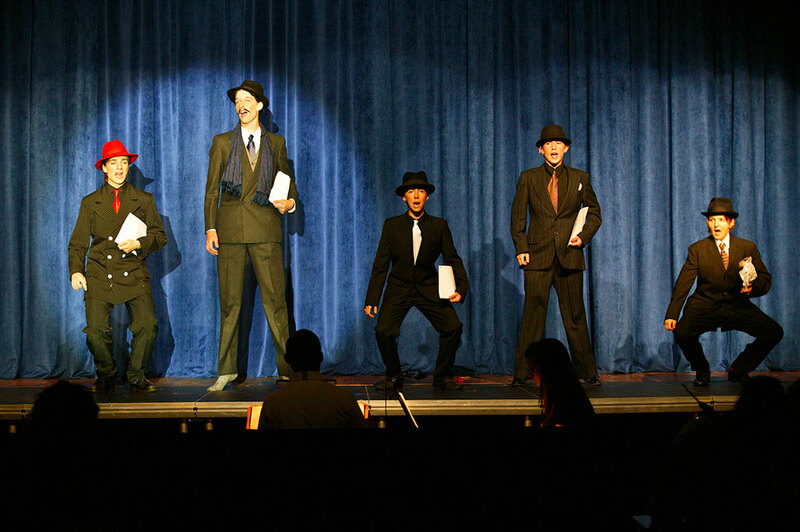 Summative assessments are made in line with the school reporting cycle. 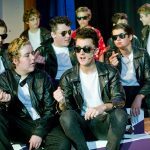 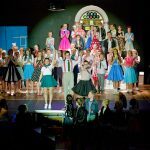 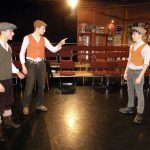 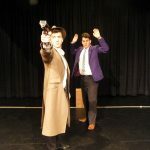 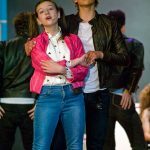 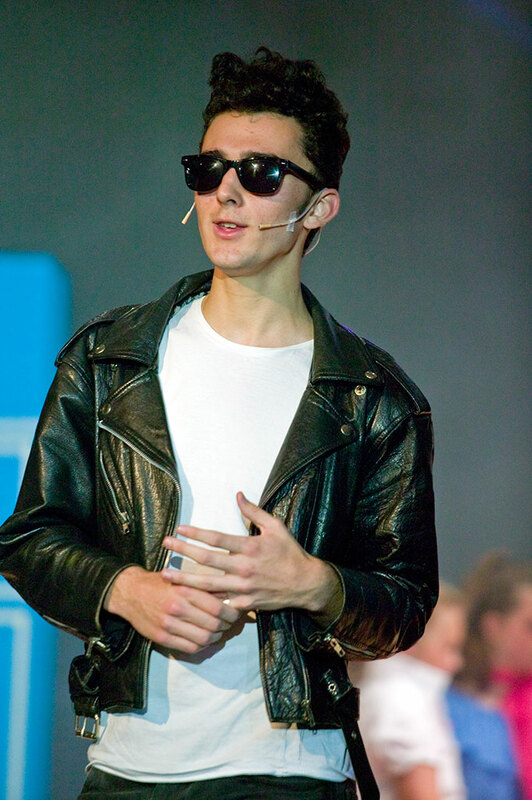 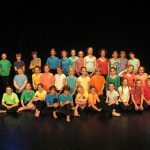 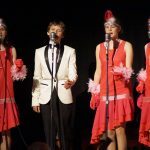 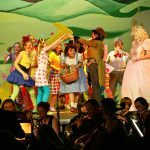 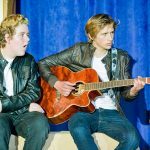 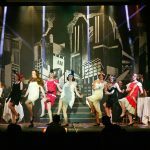 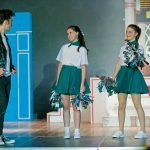 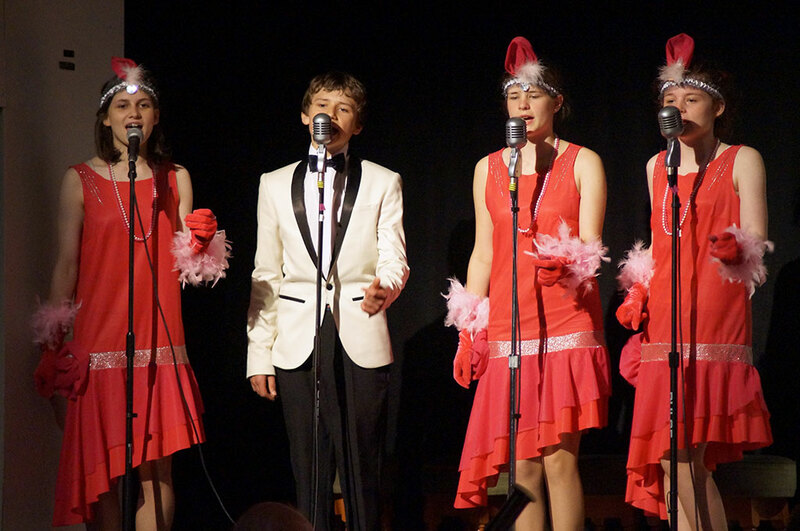 The Woodroffe School has an excellent purpose built Drama Studio, which is versatile for performance work and an inspiring space to work in for lessons. 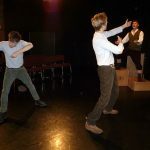 A’ level and GCSE exam performances take place in the drama studio where we have the facility to use theatrical lighting. 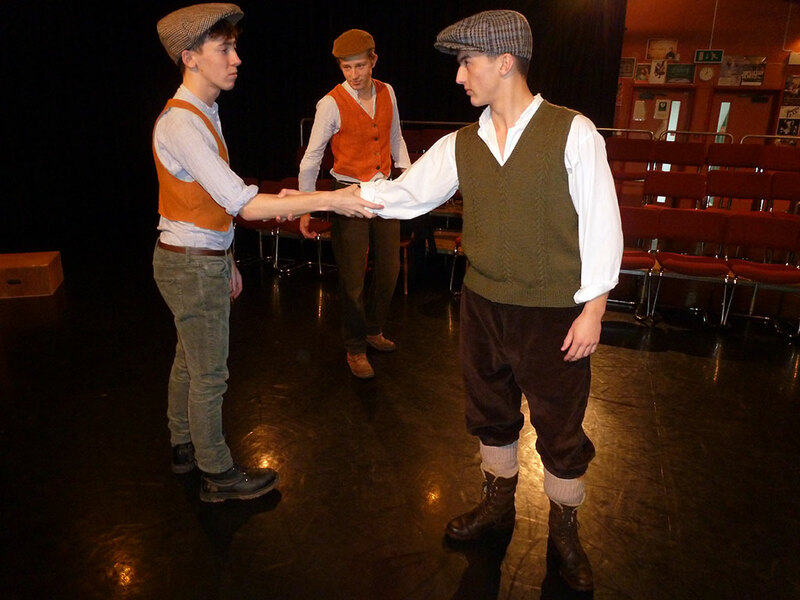 In the past the space has been used for theatre-in-the-round, traverse and promenade performances to name but a few. 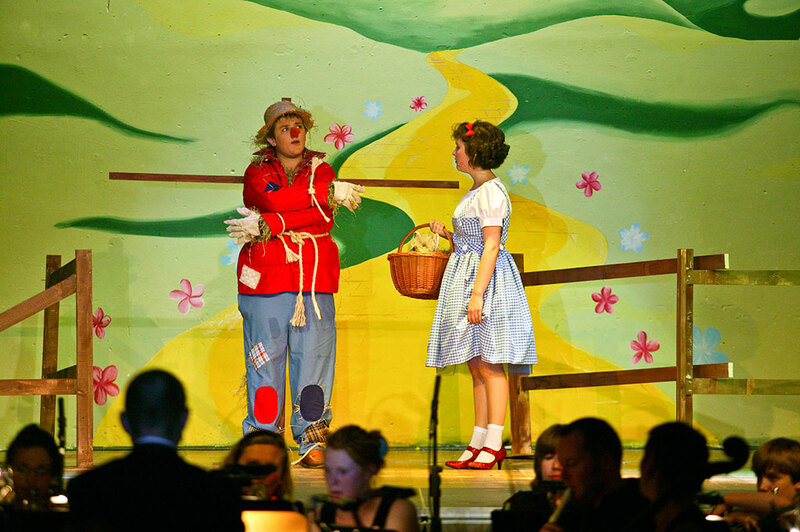 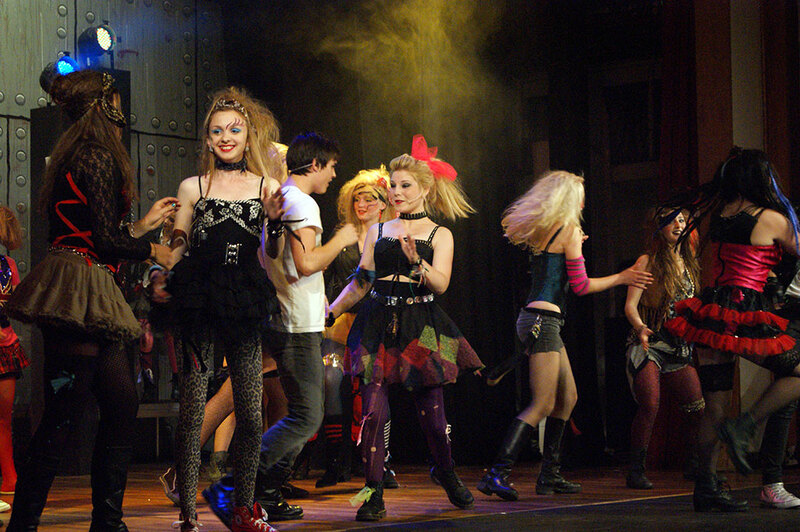 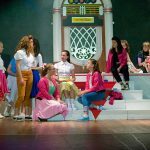 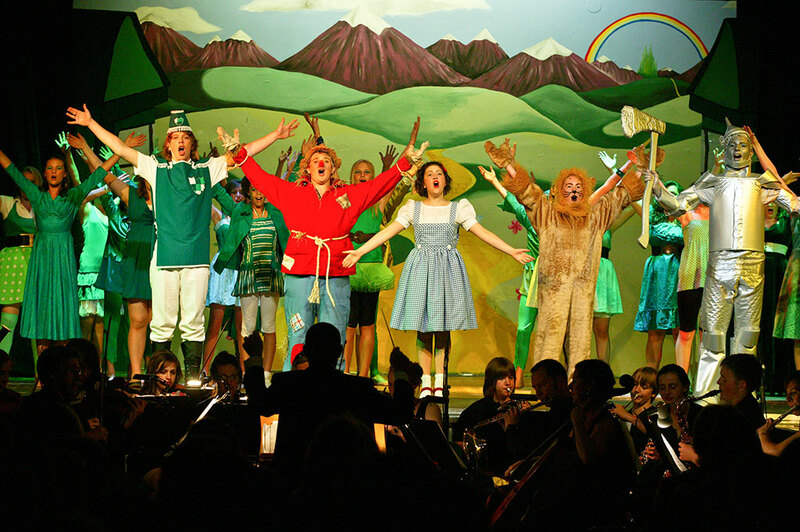 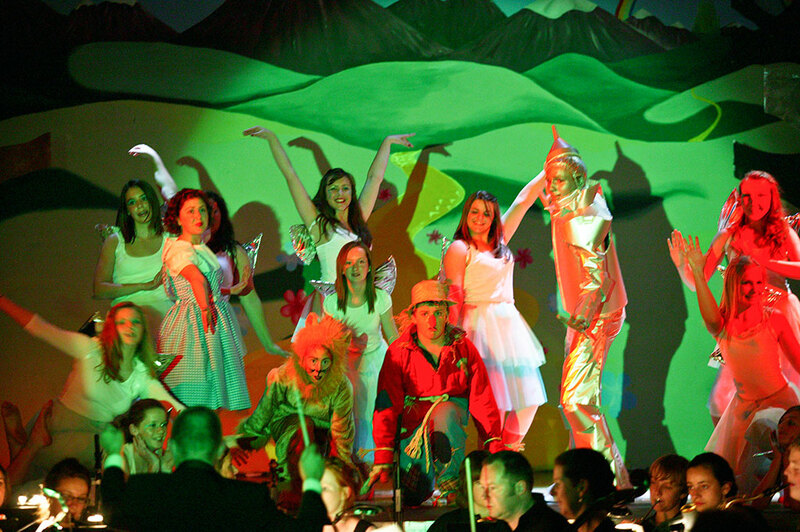 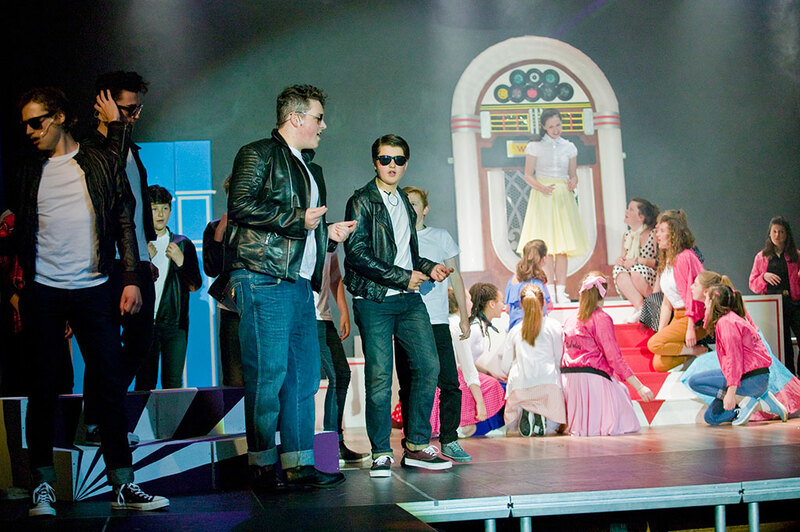 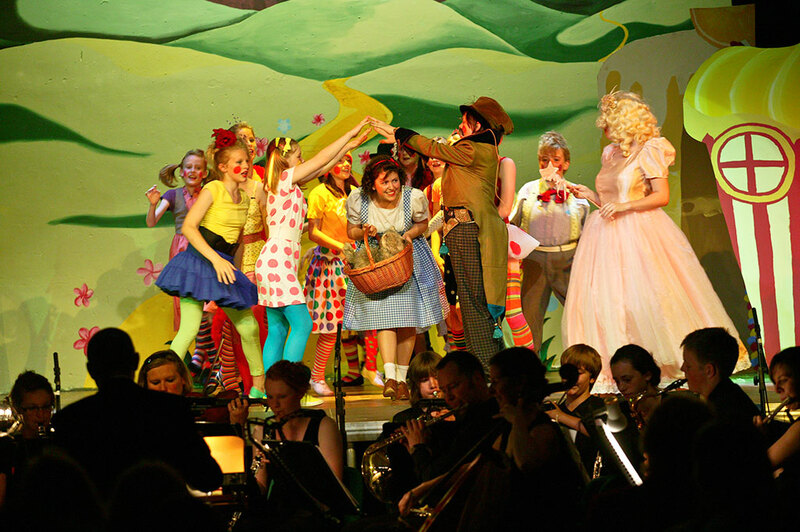 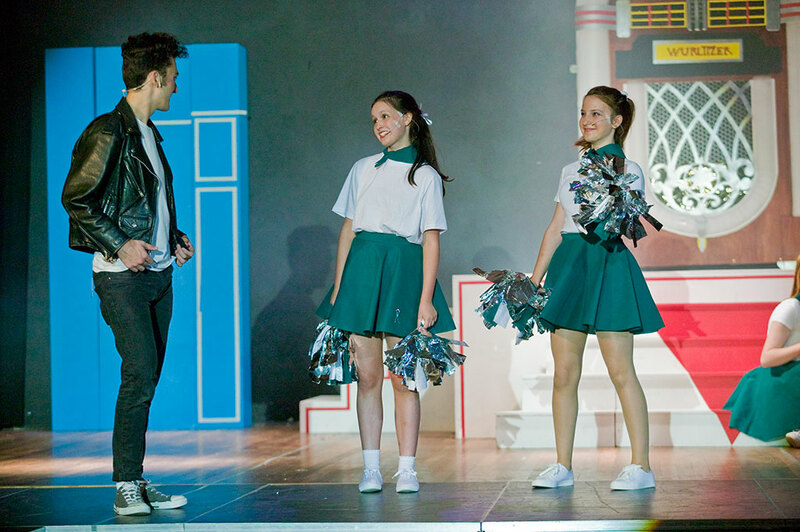 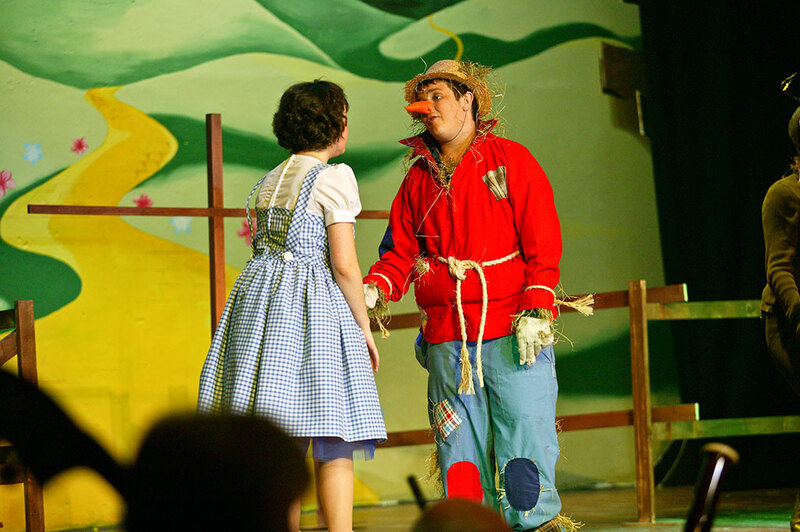 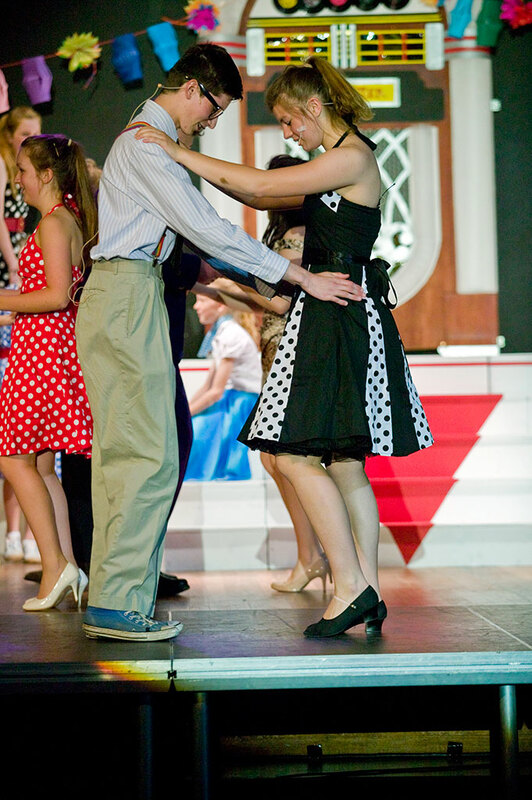 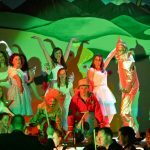 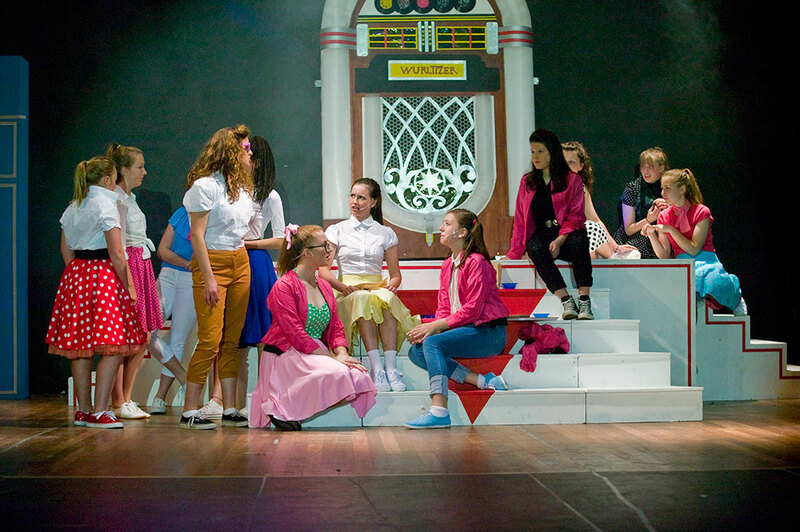 Woodroffe also has a traditional school hall and stage which is used for our bi-annual whole school musical. 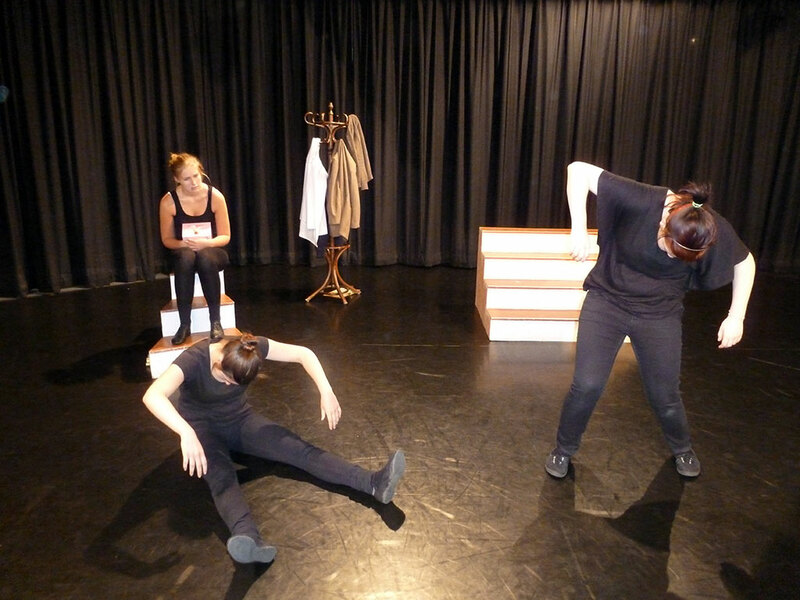 We also have access to a dance studio with mirrors. 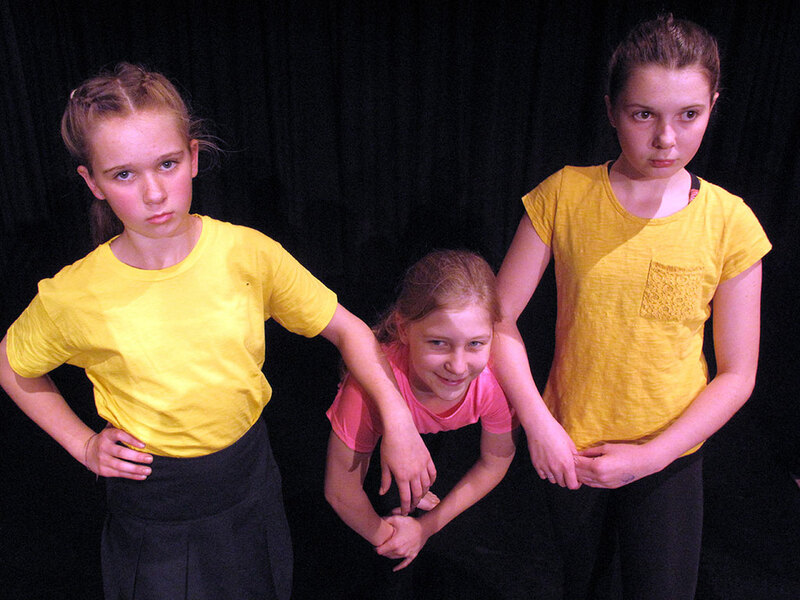 Year 7 Drama Club – at the start of the autumn we run a drama club for the Year 7, twice a week after school just until the October half term. 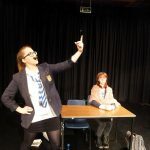 In this time we create an ensemble performance lasting about ten minutes which is performed at the ‘Meet My Tutor’ evening towards the end of October, in front of a massive audience of Year 7 parents. 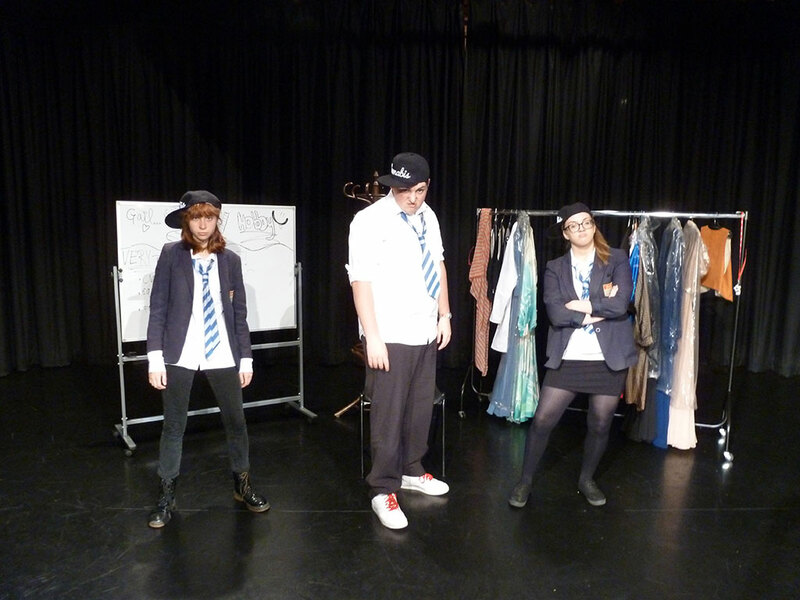 There is always a large take up for this and so we enlist the help of A’ level drama students. 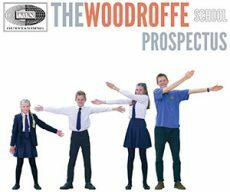 This provides an early opportunity for new students who enjoy the creative arts to get involved in something exciting and meaningful in their first half term at Woodroffe. 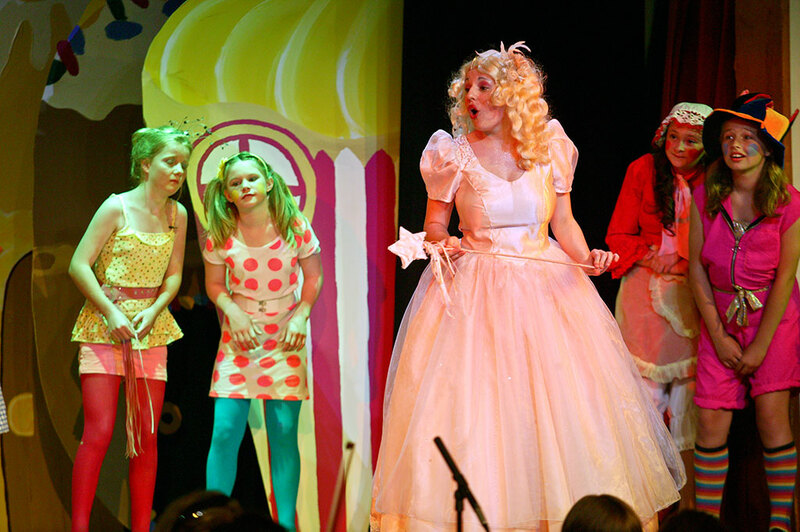 This year we used Roald Dahl’s Revolting Rhyme of ‘Cinderella’. 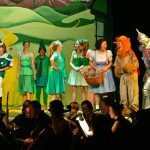 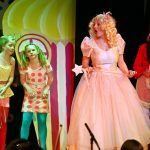 Every year at the end of the autumn term all of the Year 7 with their tutors, co-tutors and year head are taken to watch a professional pantomime. 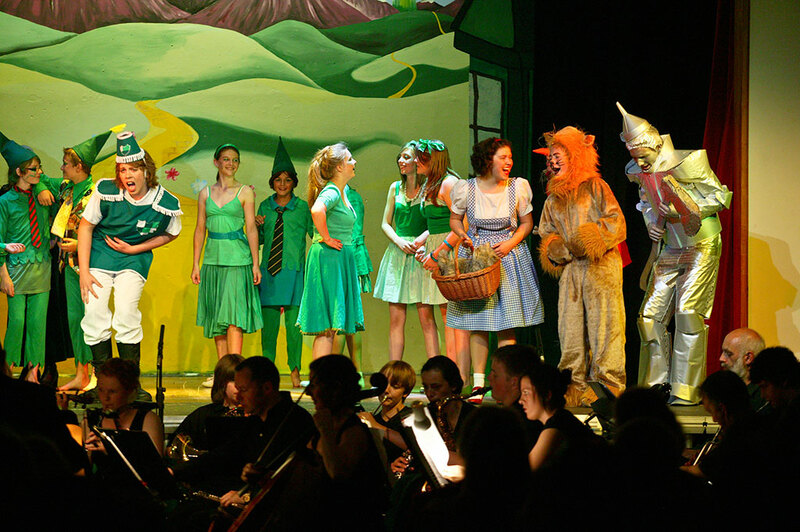 We usually go to the Octagon Theatre in Yeovil, this year it is ‘Peter Pan’. 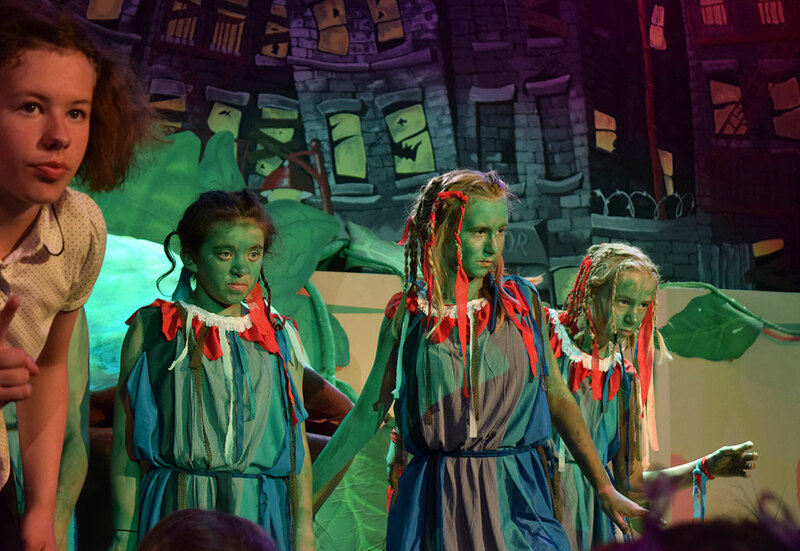 The Year 7 spend the second half of the autumn term exploring the pantomime genre in their lessons, looking at for example, silent comedy and slapstick and so watching a pantomime is a great way to finish off this project. 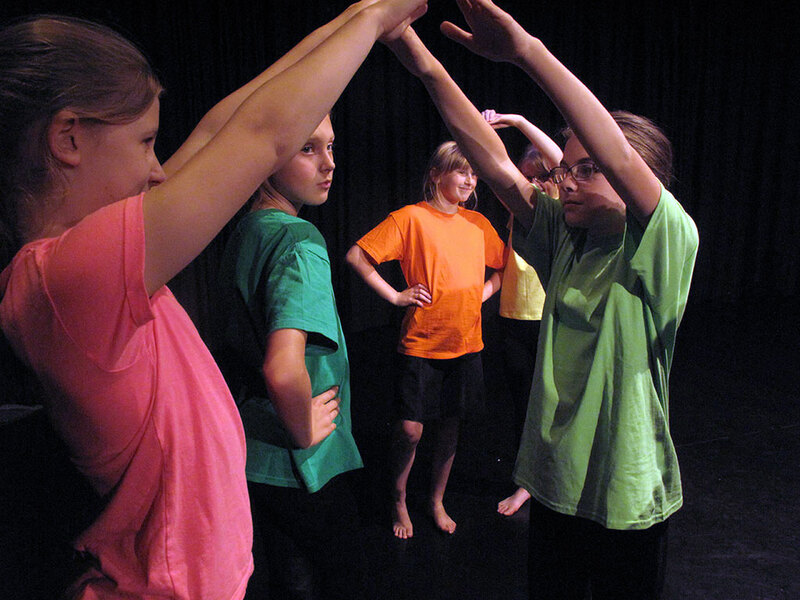 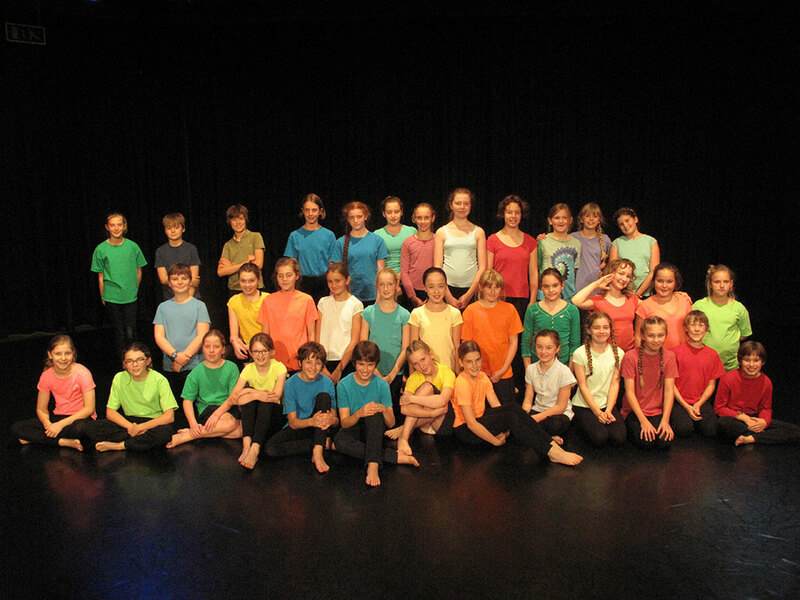 Year 8 and 9 Drama clubs are also run at different times and on different themes and skills. 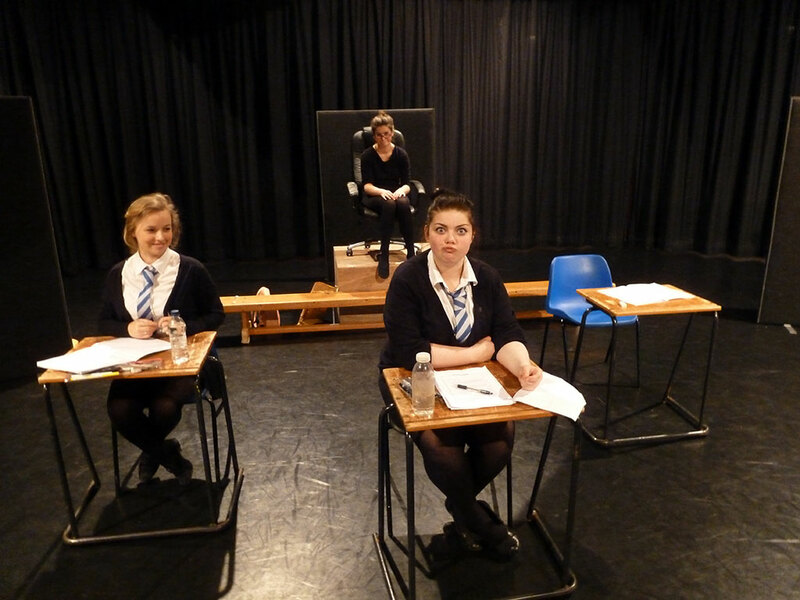 GCSE and A’ level exam work is rehearsed at lunch times and after school. 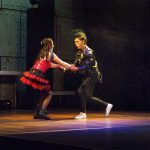 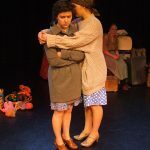 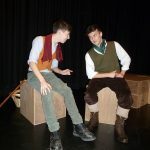 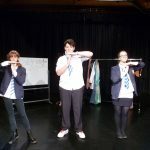 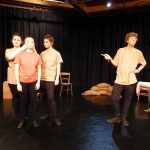 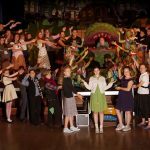 In the past we have taken part in the Shakespeare Schools Festival and NT Connections. 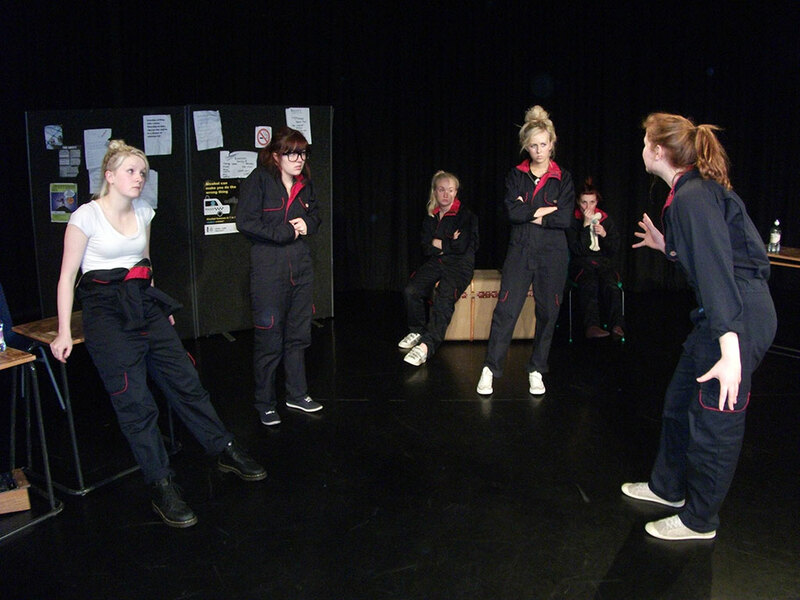 We also always take up the offer of theatre practitioners coming in to run workshops with our students. 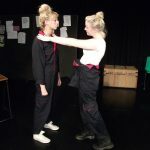 Recently Told by an Idiot were performing ‘Heads Will Roll’ at The Marine Theatre and we were offered a free school workshop exploring the production and the style the company work in. 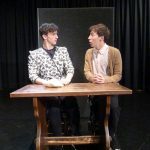 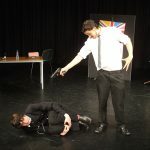 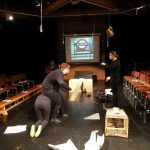 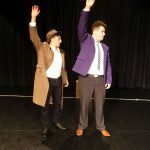 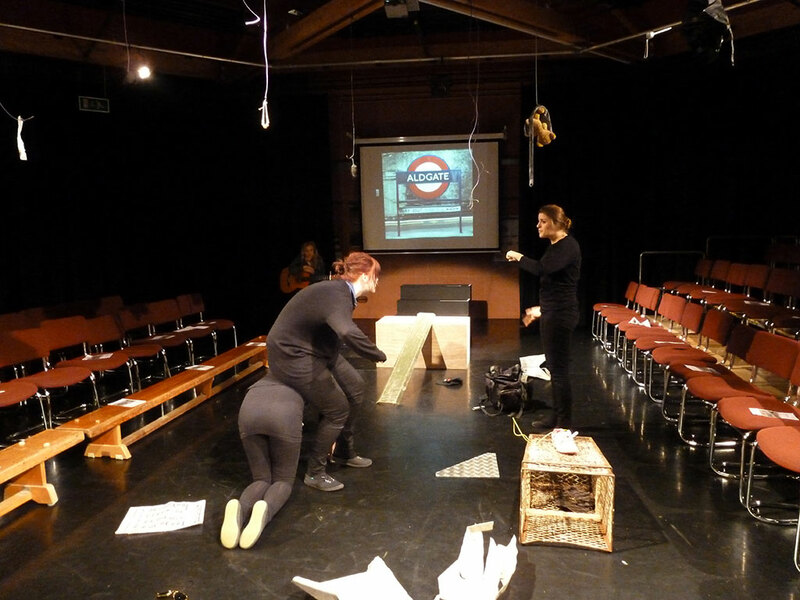 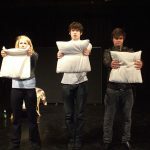 Last year we were lucky enough to be offered a workshop from Splendid Theatre Company on Christopher Marlowe and Spendid’s Brechtian style of working. 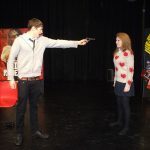 Theatre Centre visit us every year with a performance of their current production, they are an excellent theatre company, based in London, who always produce stimulating and inspiring theatre for young people. 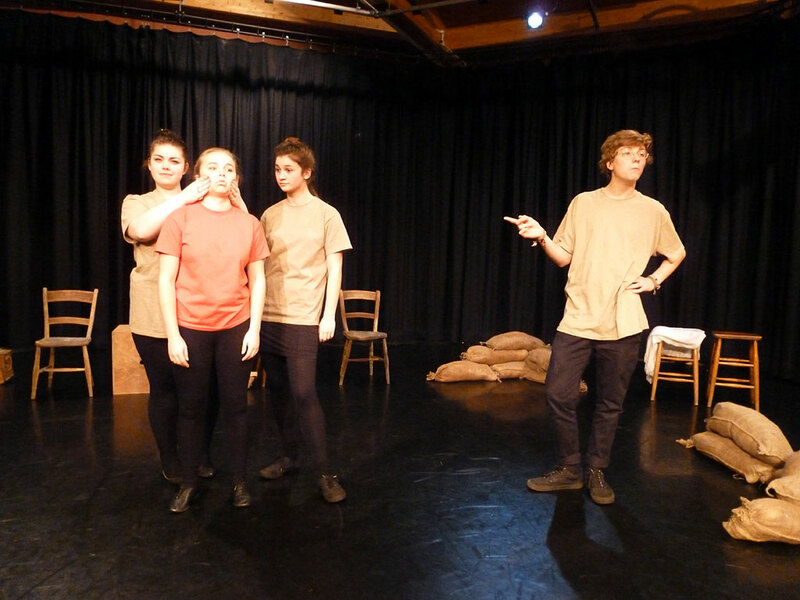 All our drama students from year 9 upwards watch the Theatre Centre productions and then we use that experience in drama lessons in all sorts of exciting ways. 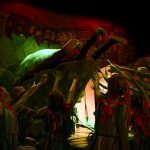 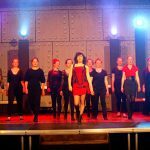 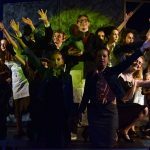 Theatre trips – we feel that it isn’t possible to develop into really successful drama students without regular trips to the theatre. 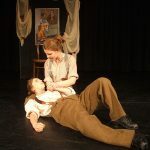 We have a very positive relationship with our local theatre, The Marine, in Lyme Regis and regularly see interesting and wide ranging performances there. 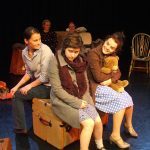 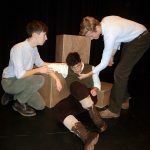 We also go to larger theatres in the South West such as The Theatre Royal, Plymouth and the Northcott, Exeter, where we recently saw ‘The Woman in Black’ and ‘A Pacifist’s Guide to the War on Cancer’. 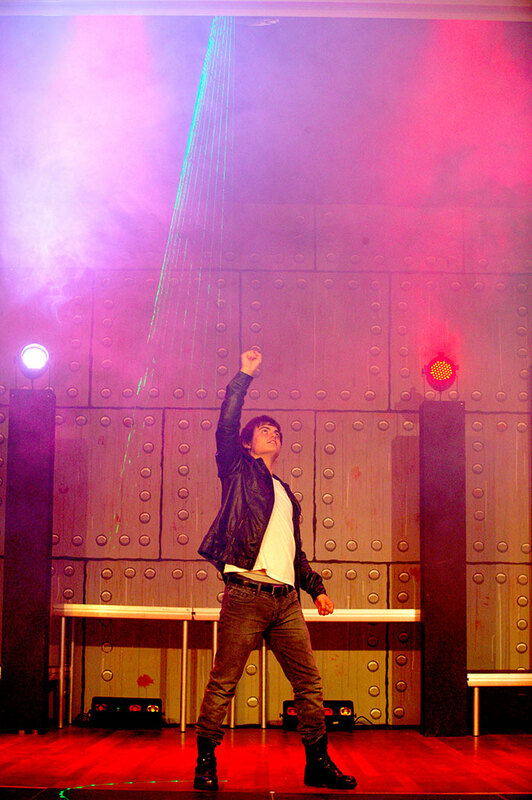 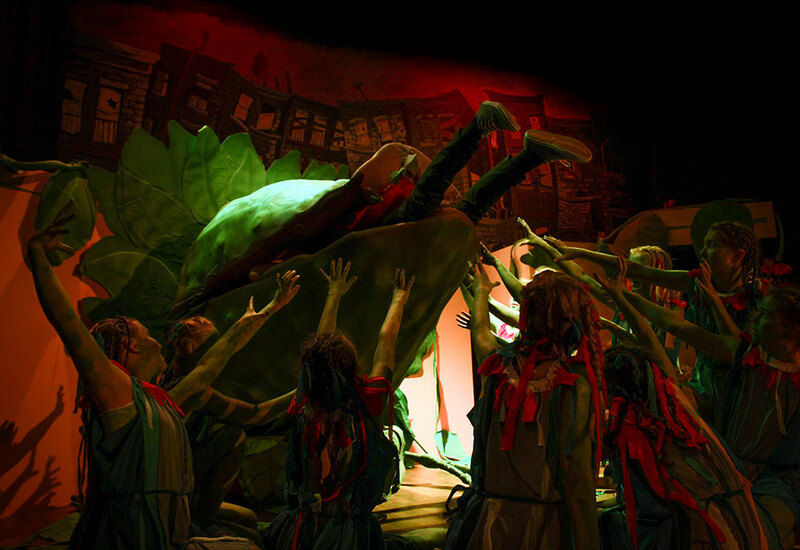 We also go to London for experiences of for example, the West End and The National Theatre. 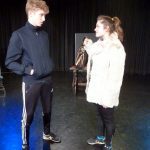 Theatre companies that we particularly admire and try and see, especially with our A’ level students are Theatre Alibi, Angel Exit, Splendid, Kneehigh, Frantic Assembly, Actors of Dionysus, Shared experience and Cheek by Jowl. 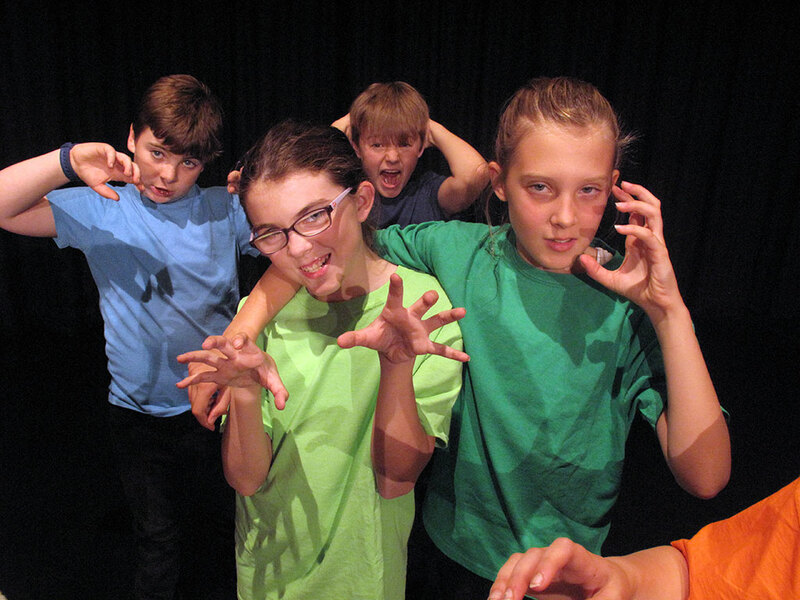 Students have one lesson of drama a week and are taught in their tutor group. 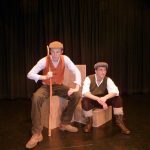 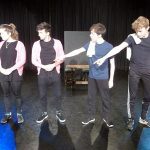 Over the two years they have the opportunity to develop subject specific skills with regards to performance, directing and devising. 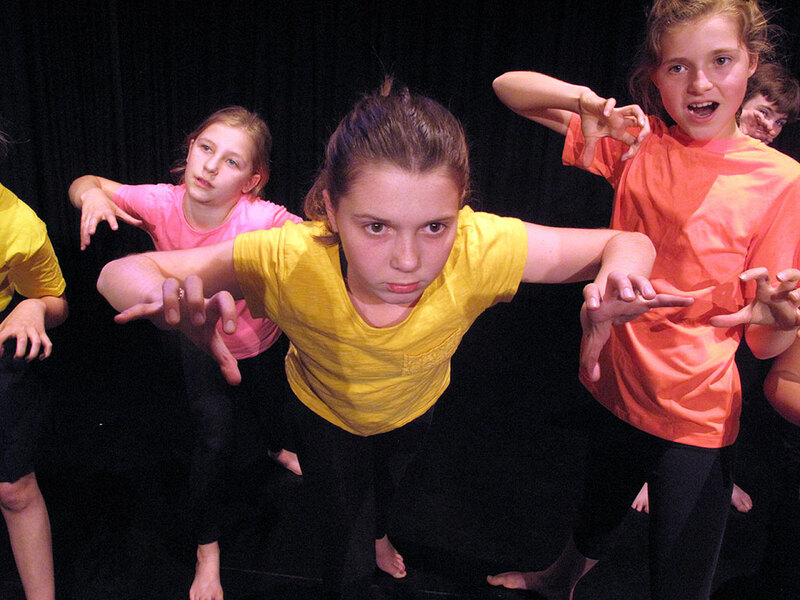 Skills such as the use of physicality, vocal expression, facial expression and movement are explored regularly. 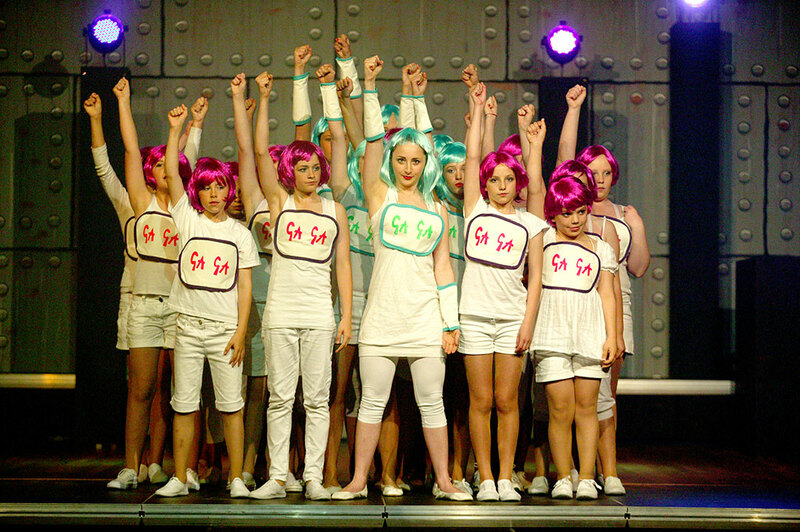 Students nearly always work in groups and so group work skills are also encouraged and developed. 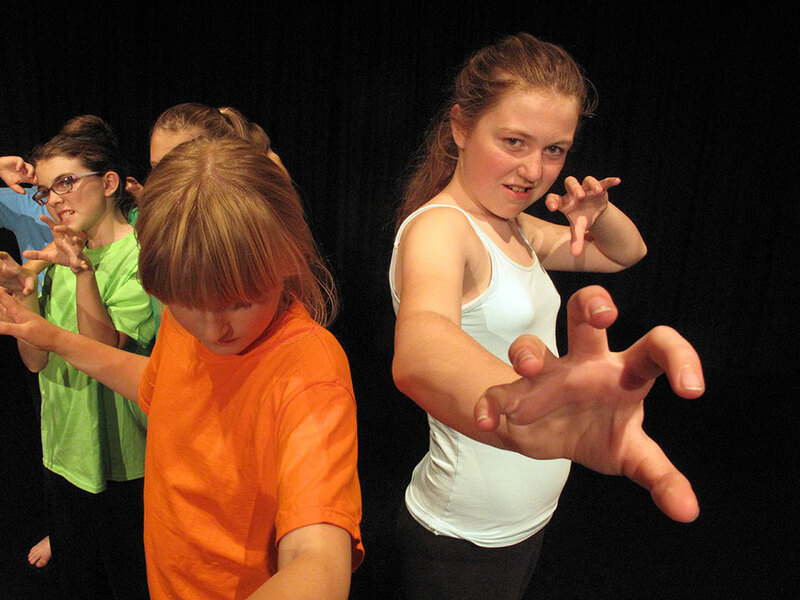 Students can opt to take a pathway that has drama in it. 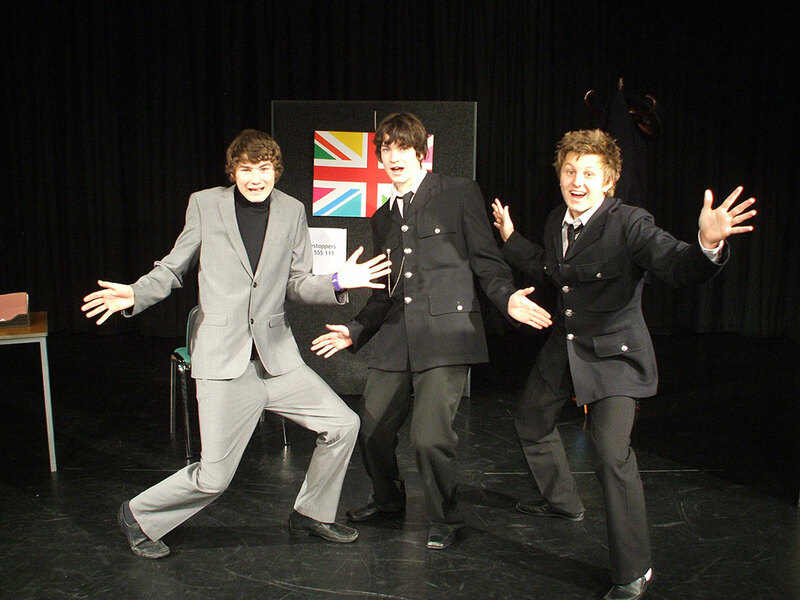 They then have two lessons of Drama a week. 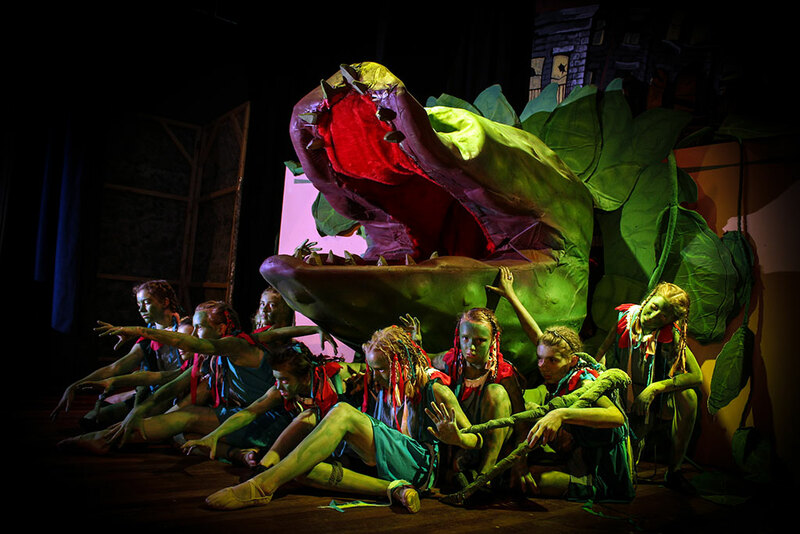 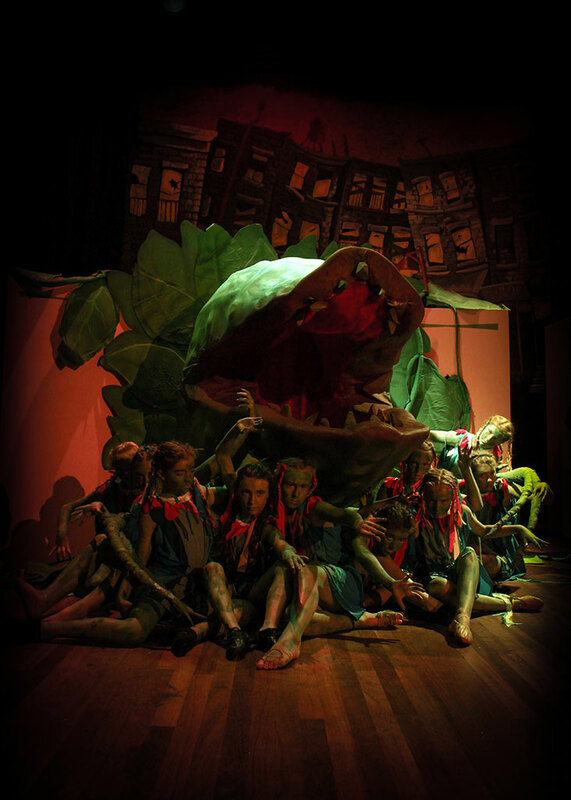 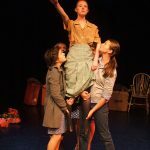 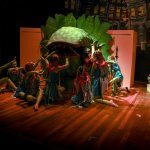 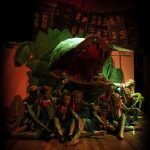 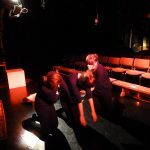 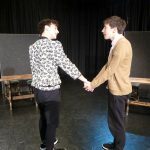 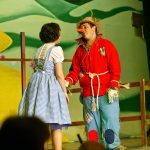 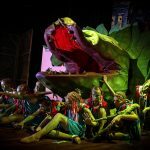 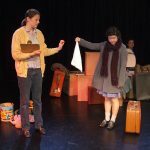 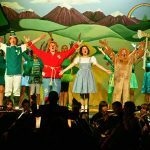 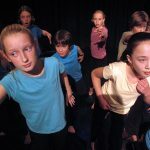 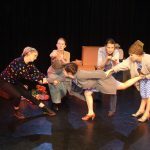 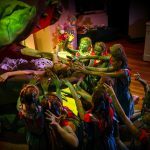 This enables students to explore and develop in more depth a wide range of drama skills such as improvisation, roles and characterisation as well as the use of voice and movement. 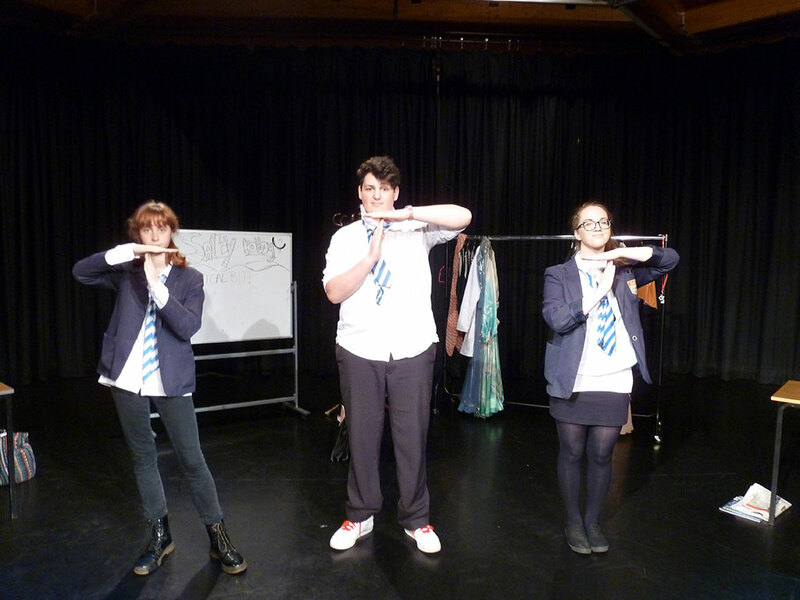 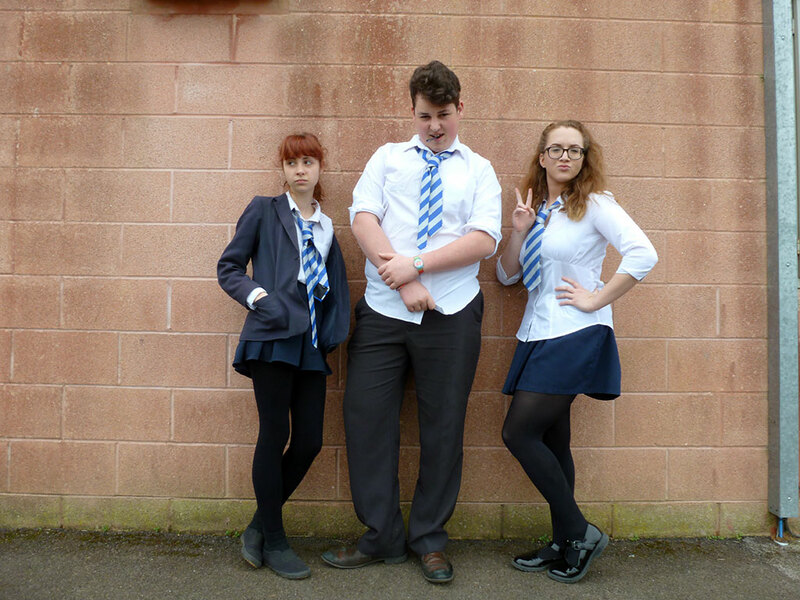 Year 9 Drama is an excellent preparation and foundation for taking GCSE Drama in Year 10. 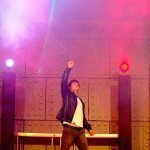 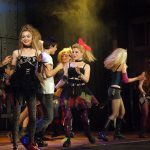 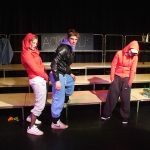 In addition there are opportunities to watch professional theatre companies and GCSE and A’ level Drama performance work. 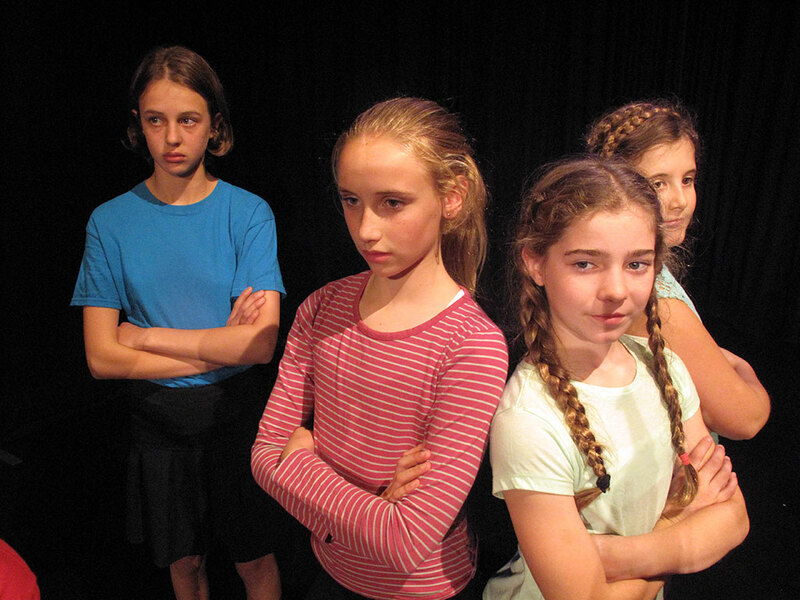 Drama also helps students develop the important life skills, including learning to work successfully with a wide range of peers, negotiation, compromise, diplomacy, leadership, problem solving and empathy. 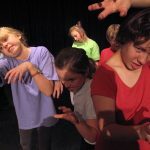 Besides life in general, these skills are also crucial to the student’s success in other subjects. 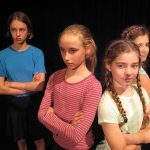 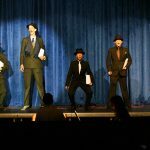 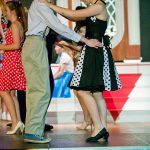 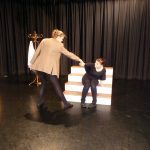 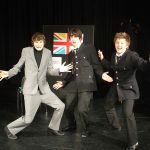 Drama lessons provide the students with numerous opportunities to expand their communication skills including listening, speaking confidently, discussion and debating. 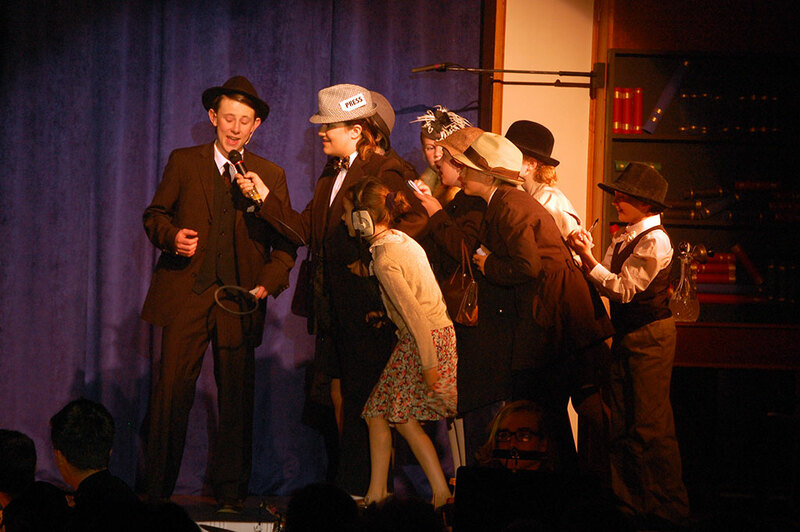 In addition, students will be challenged, asked to use their imagination and be creative. 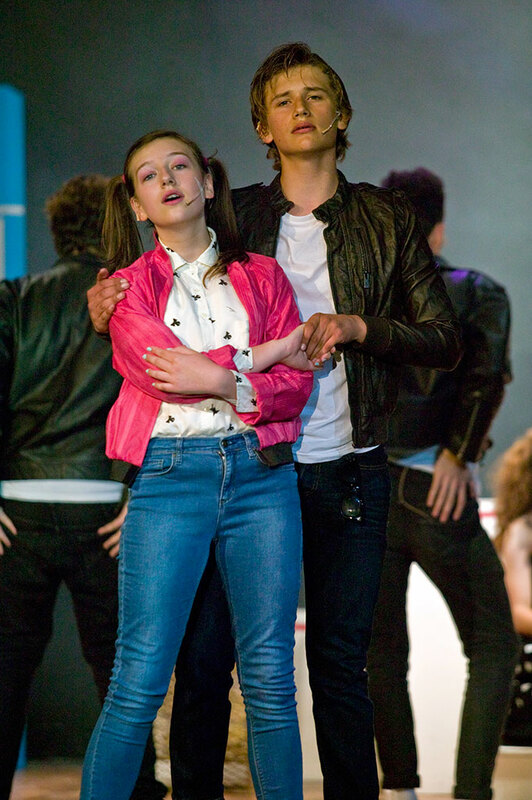 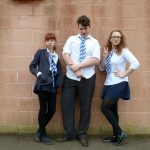 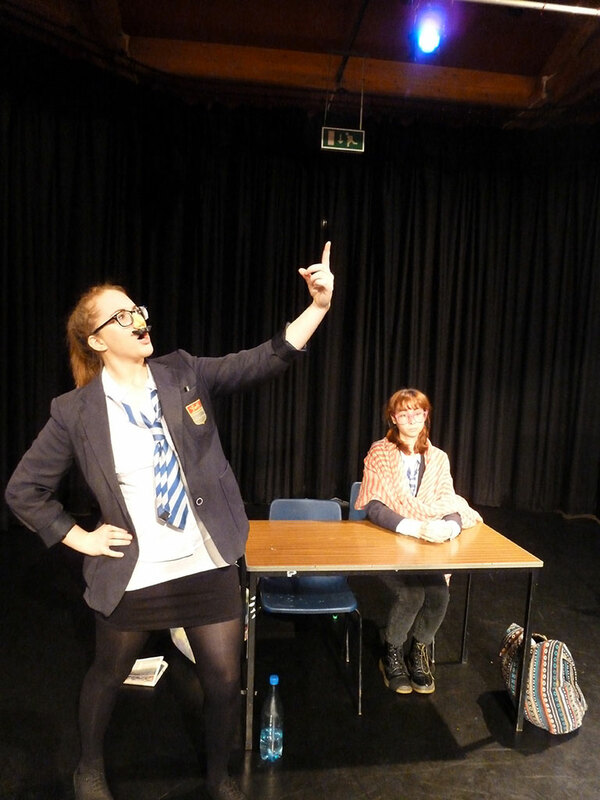 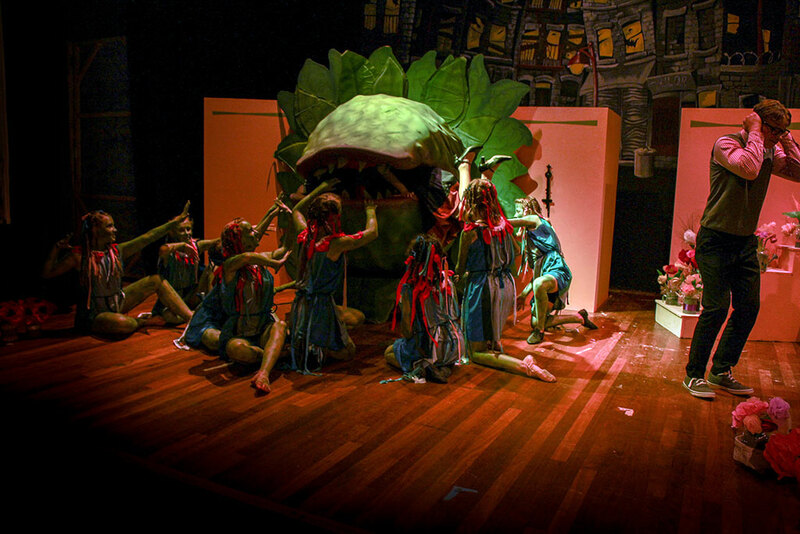 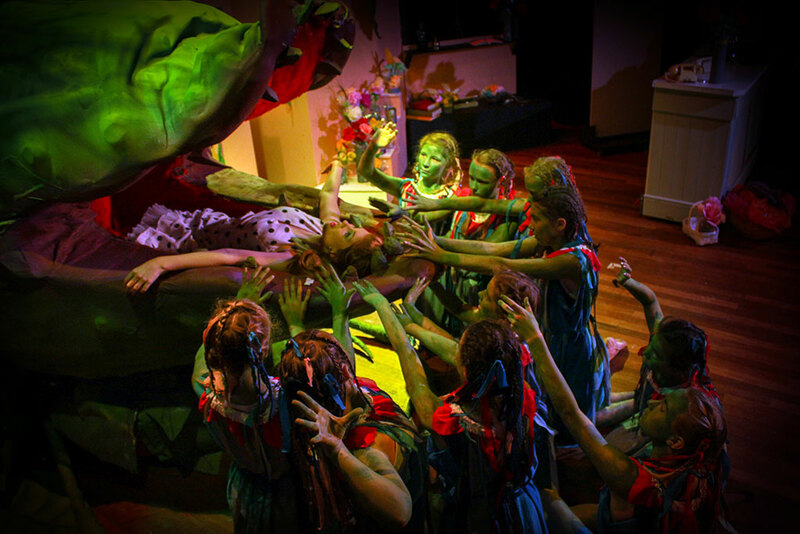 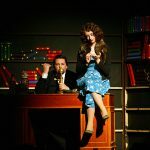 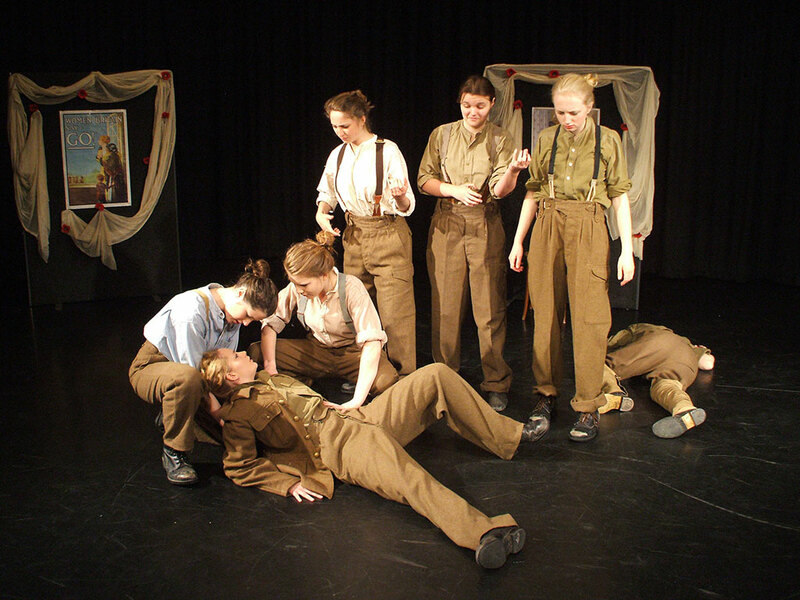 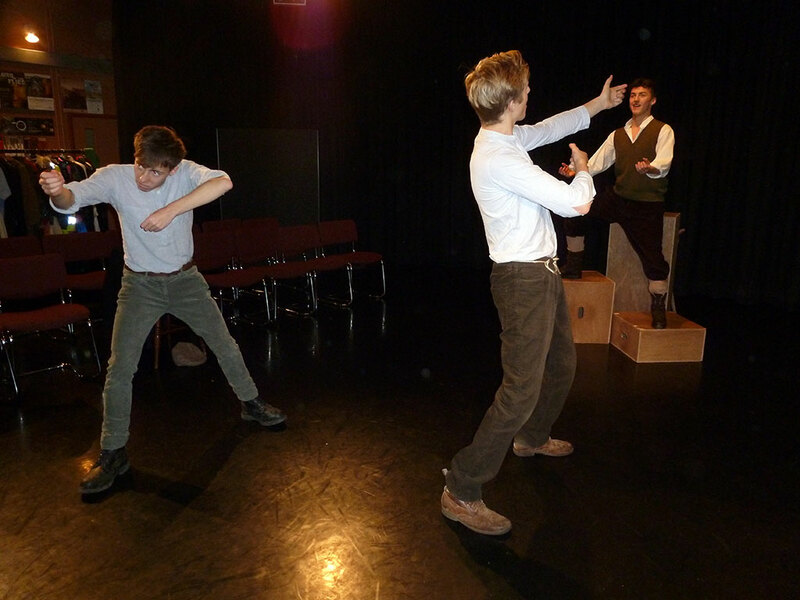 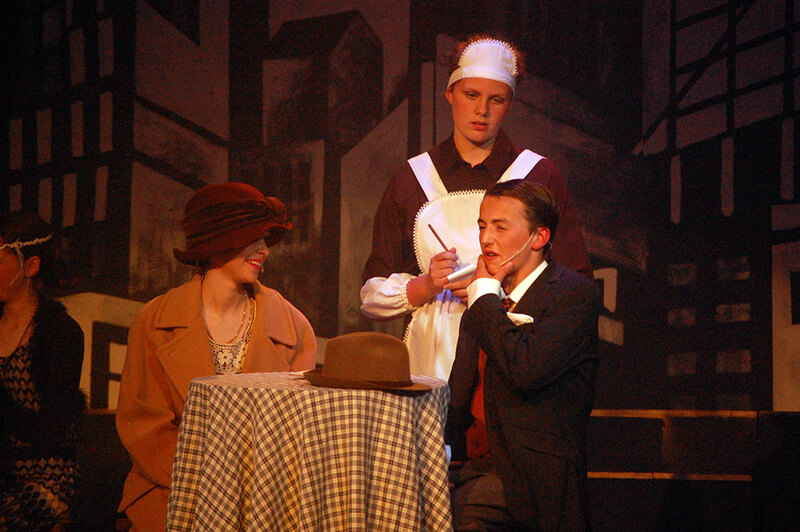 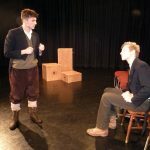 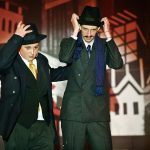 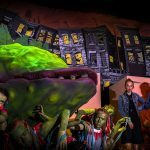 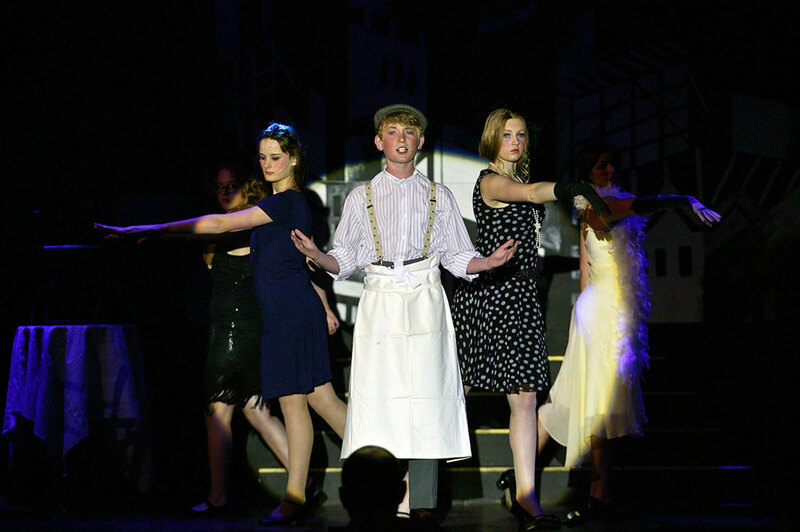 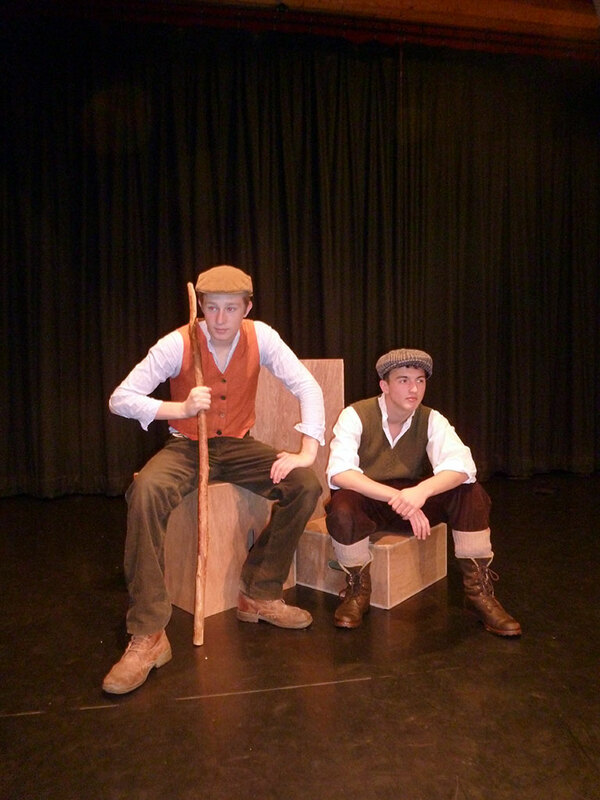 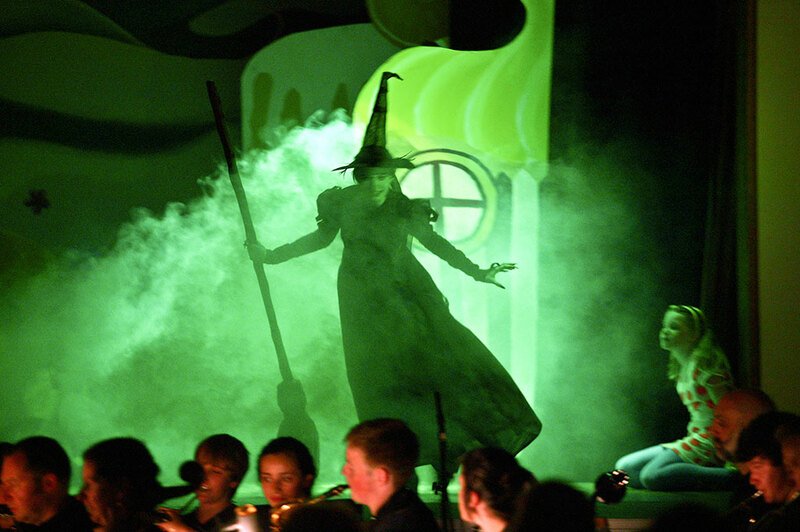 GCSE Drama is all about practically exploring and acquiring skills and techniques to appreciate and perform drama. 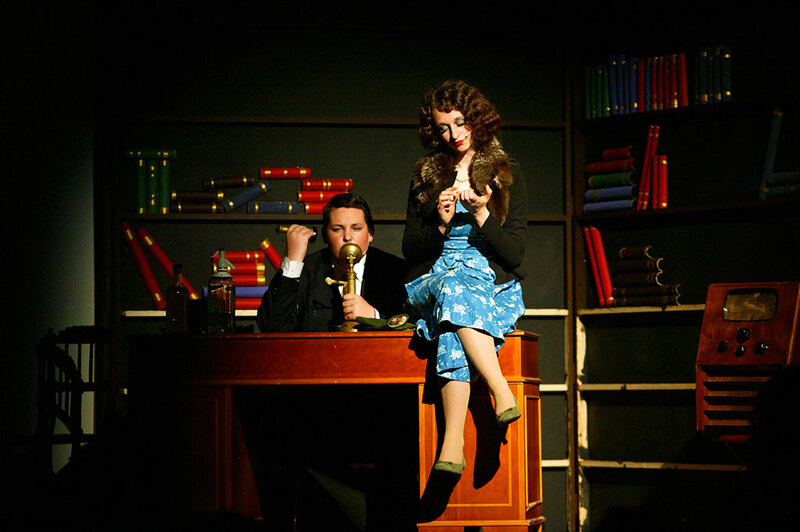 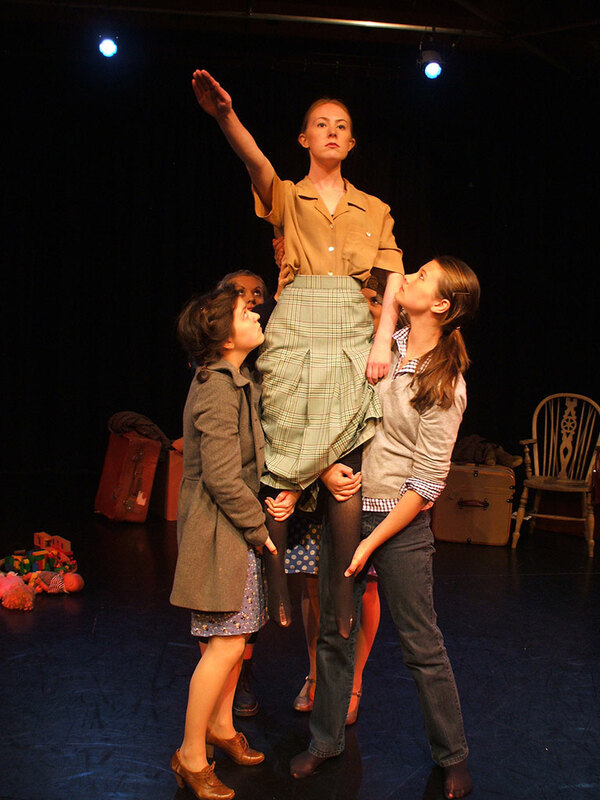 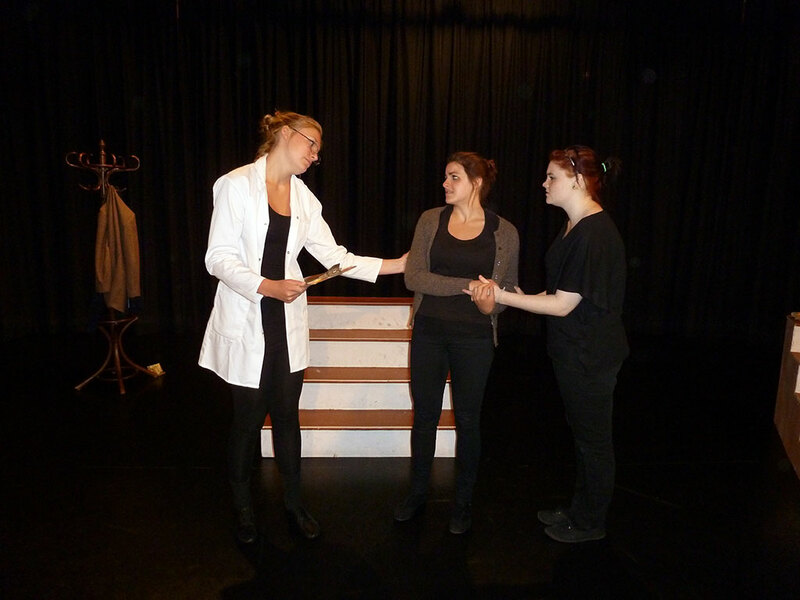 Students have the opportunity to create their own work as well as look at plays written by other people. 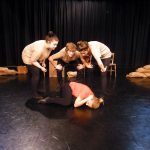 At the moment we explore ‘DNA’ by Dennis Kelly. 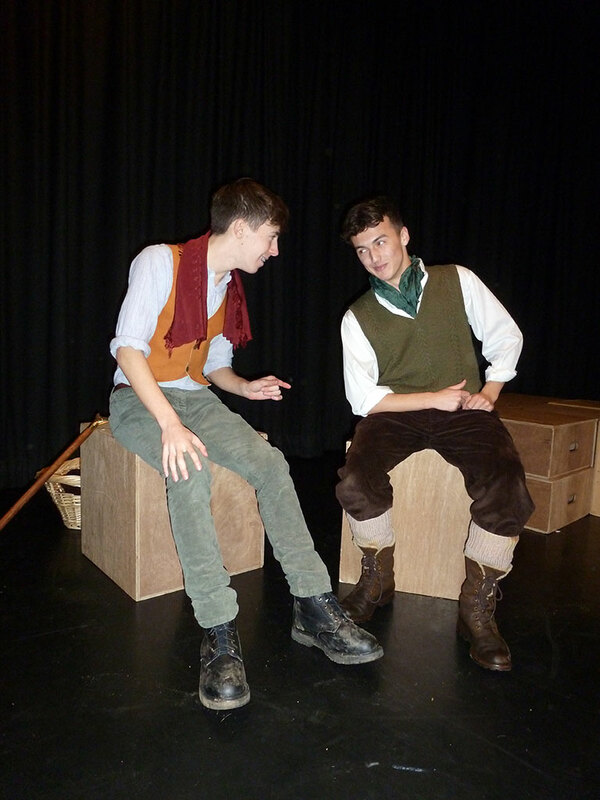 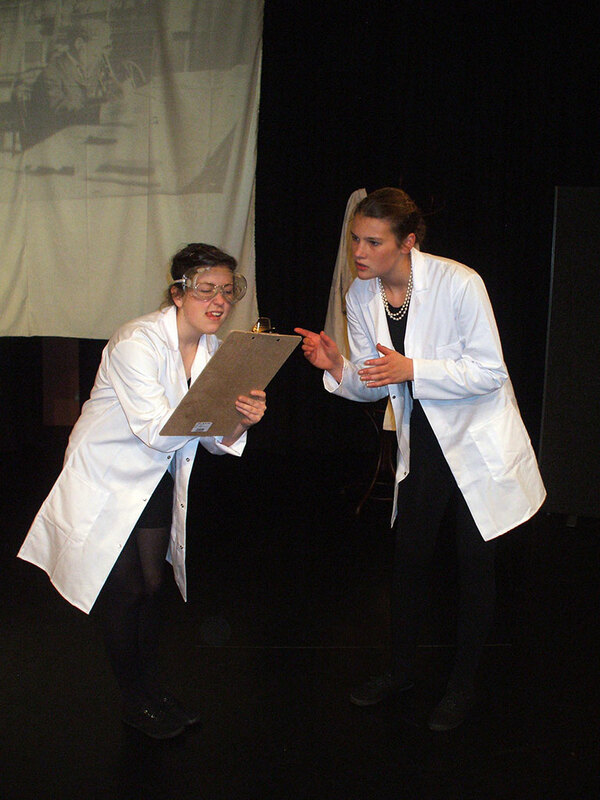 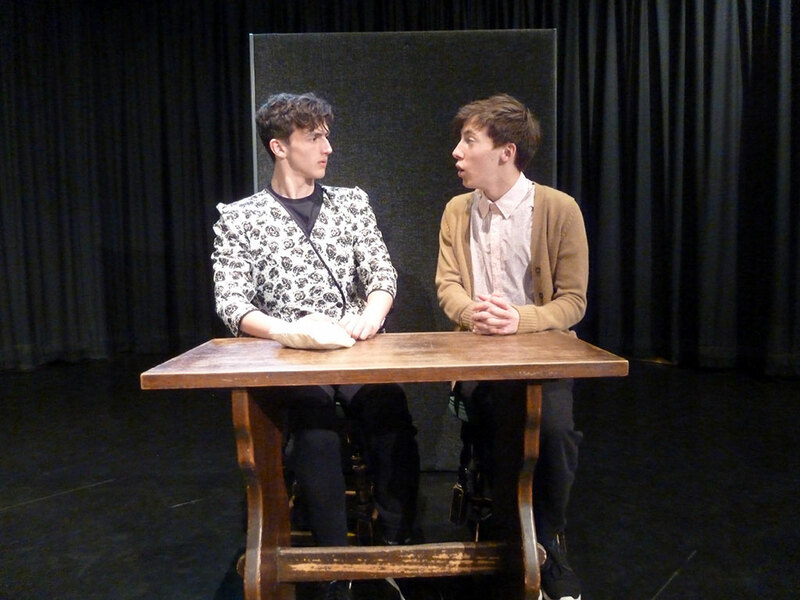 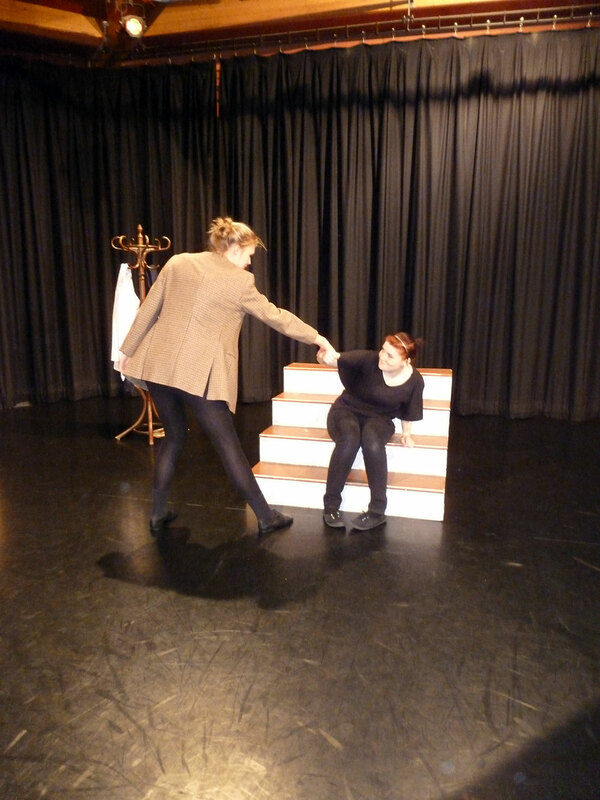 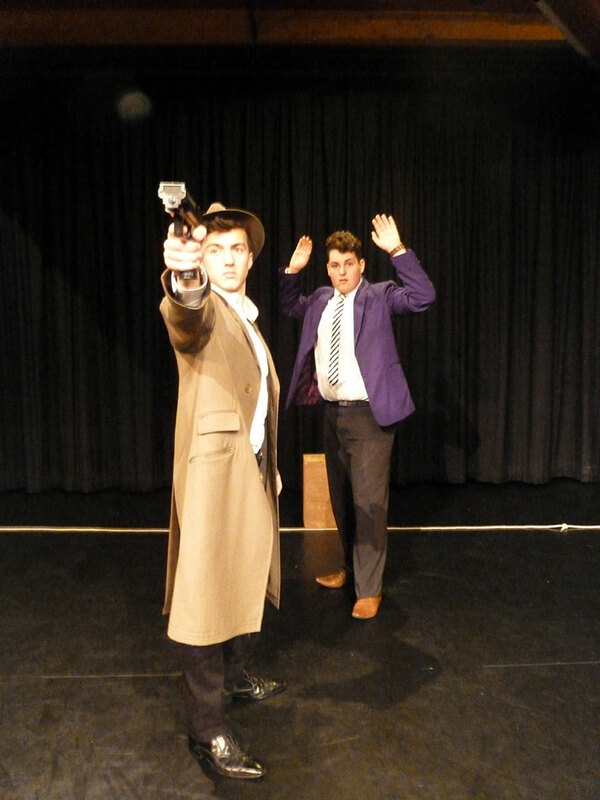 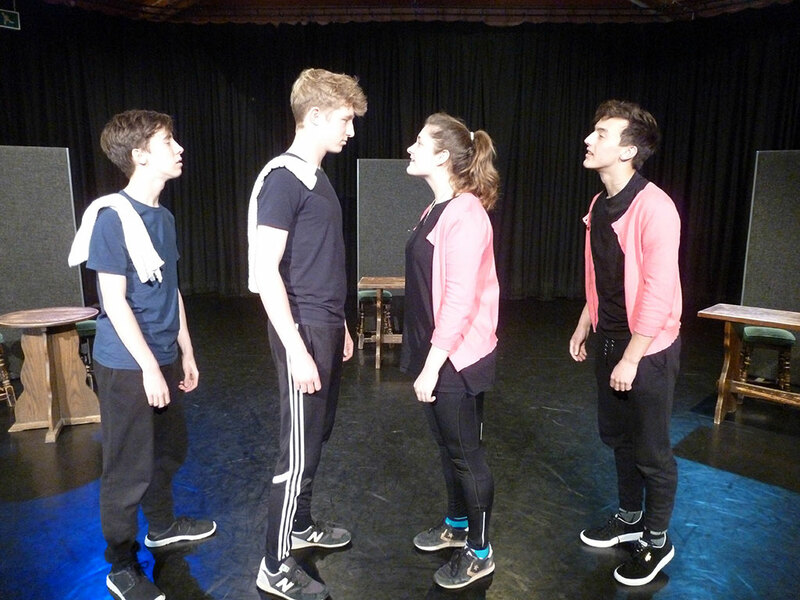 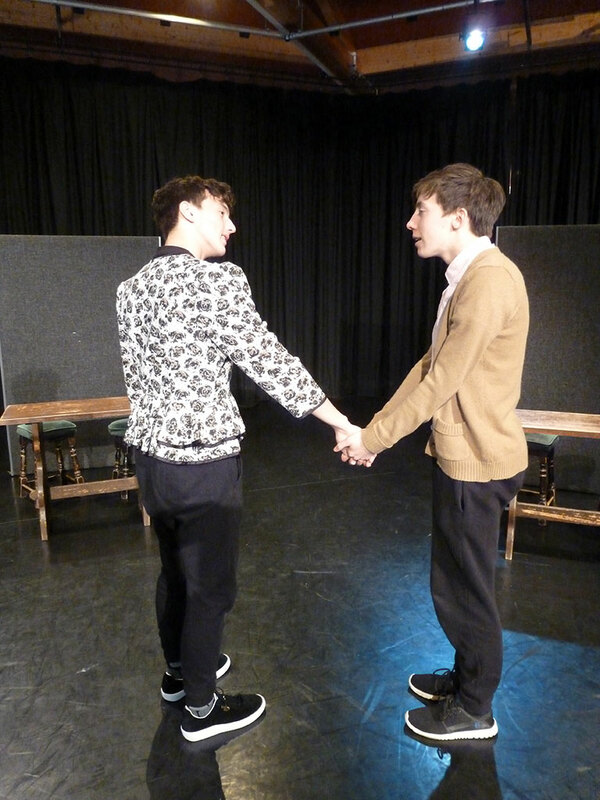 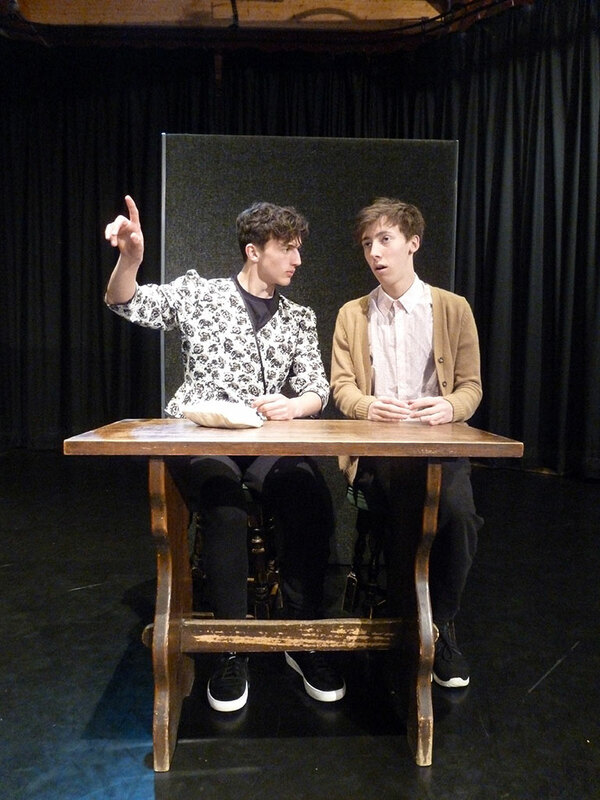 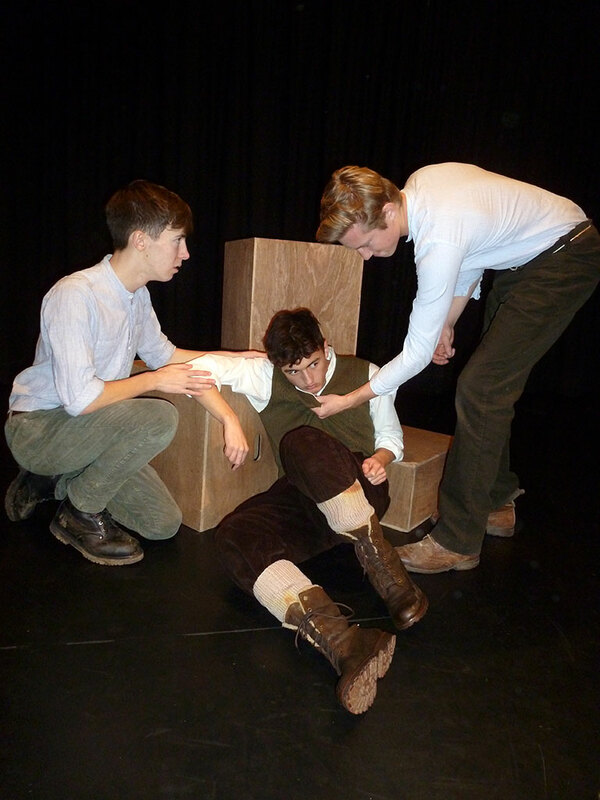 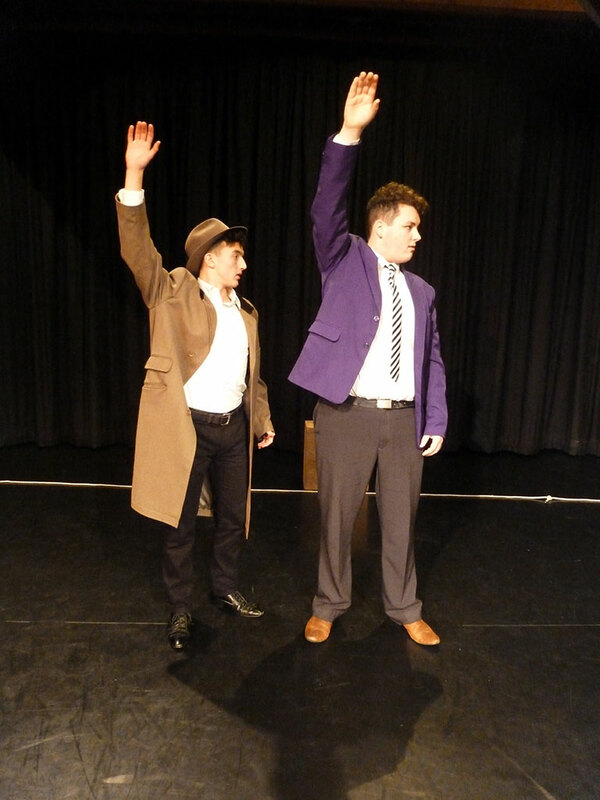 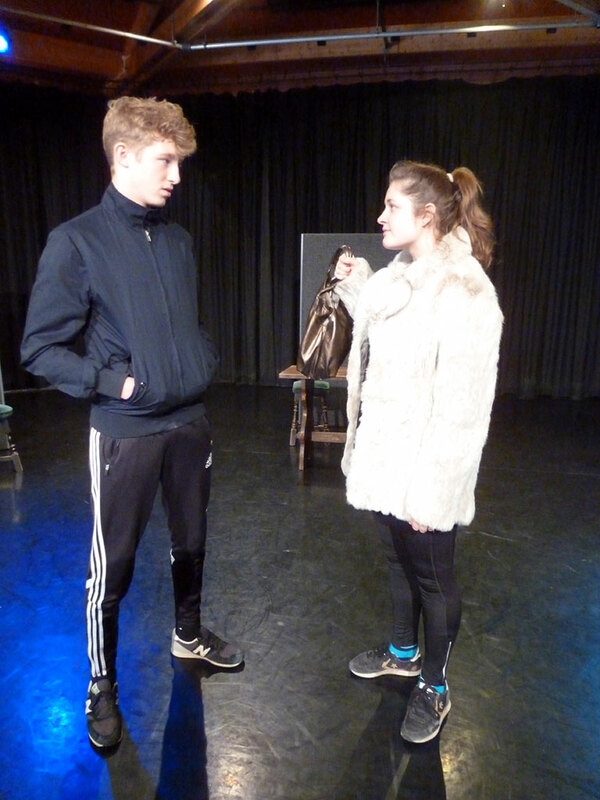 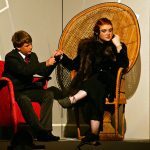 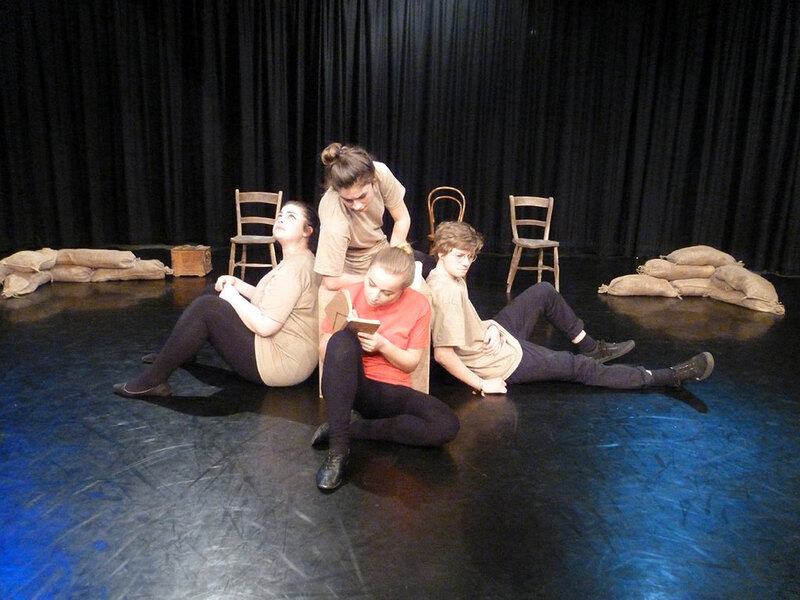 GCSE Drama allows students to develop the skills learnt in Years 7 to 9. 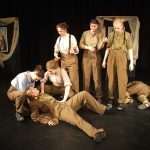 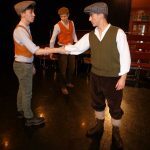 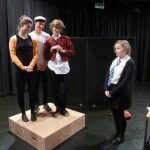 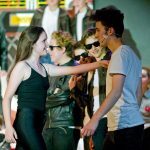 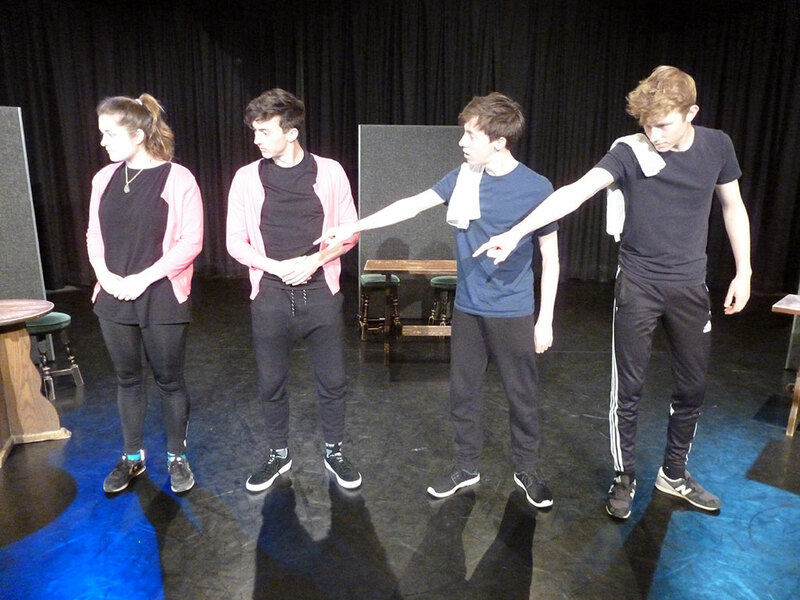 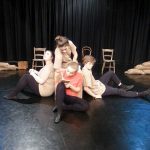 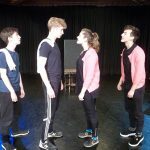 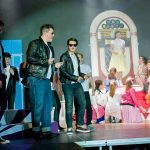 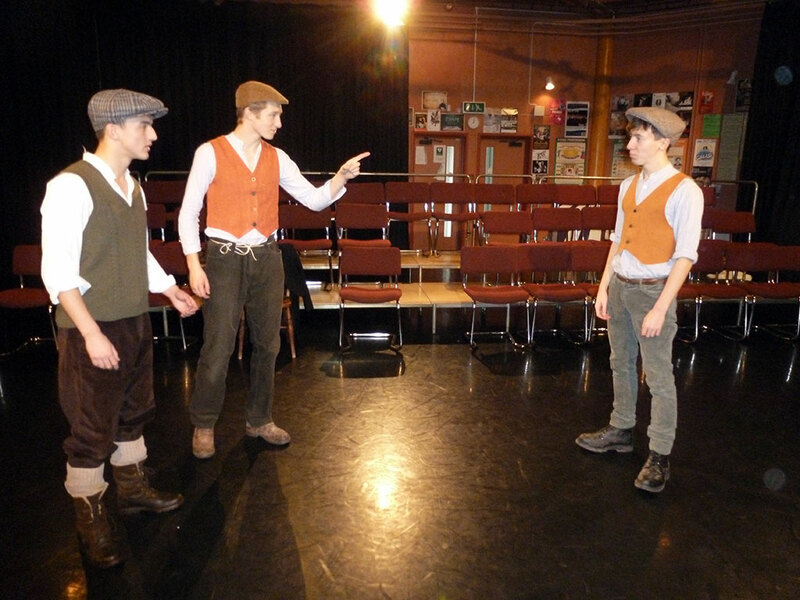 Students will enjoy the course if they want to study a subject that is both practical and creative and if they like working as part of a team as Drama involves a lot of group work. 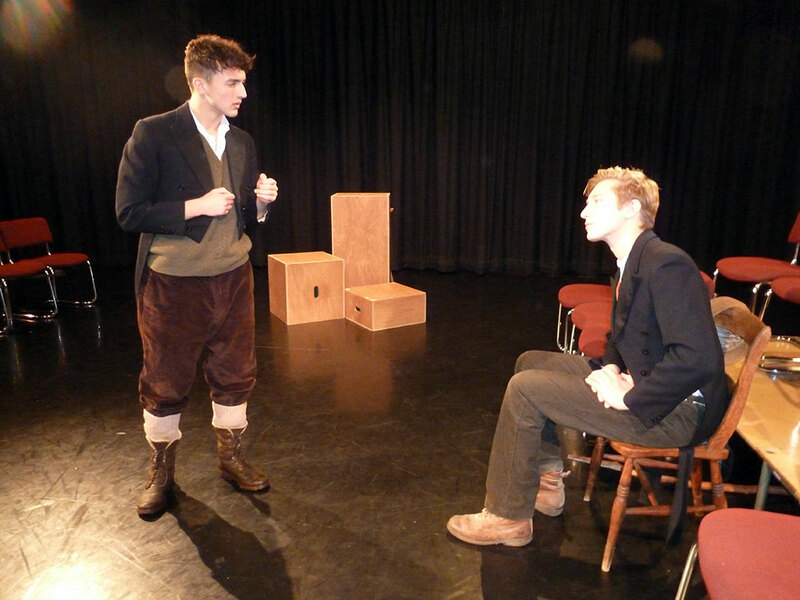 The course is demanding and challenging and is not to be viewed as an easy option. 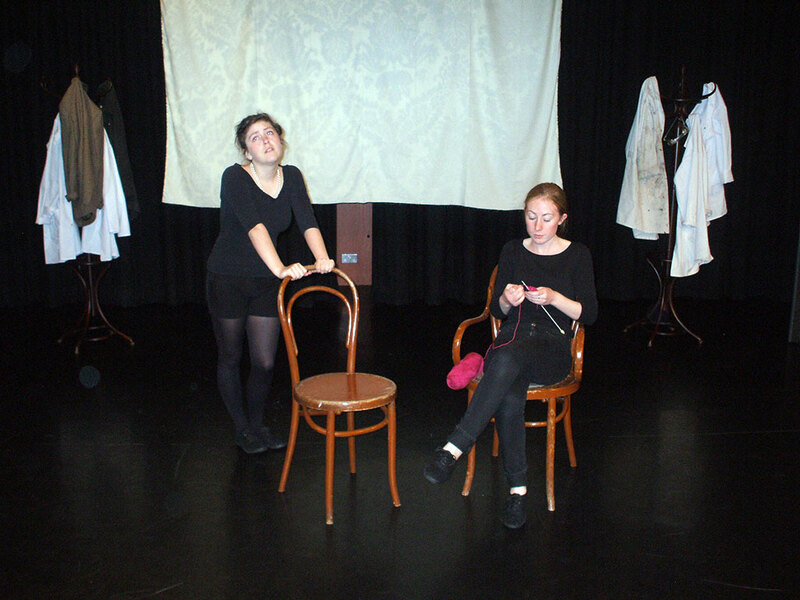 There will be written work to complete and a written exam at the end of the course. 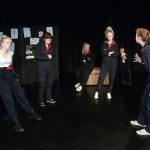 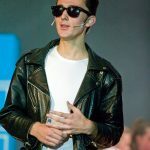 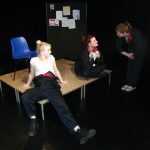 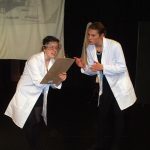 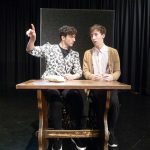 Studying Drama teaches students how to communicate effectively and solve problems with creativity, as well as providing a foundation for A Level Drama or other post 16 performing art subjects. 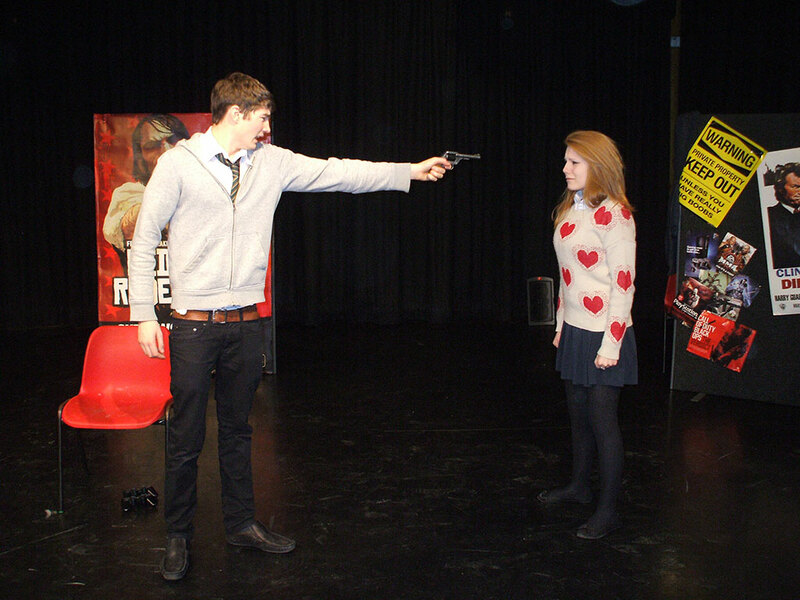 We use the Pearson GCSE drama exam. 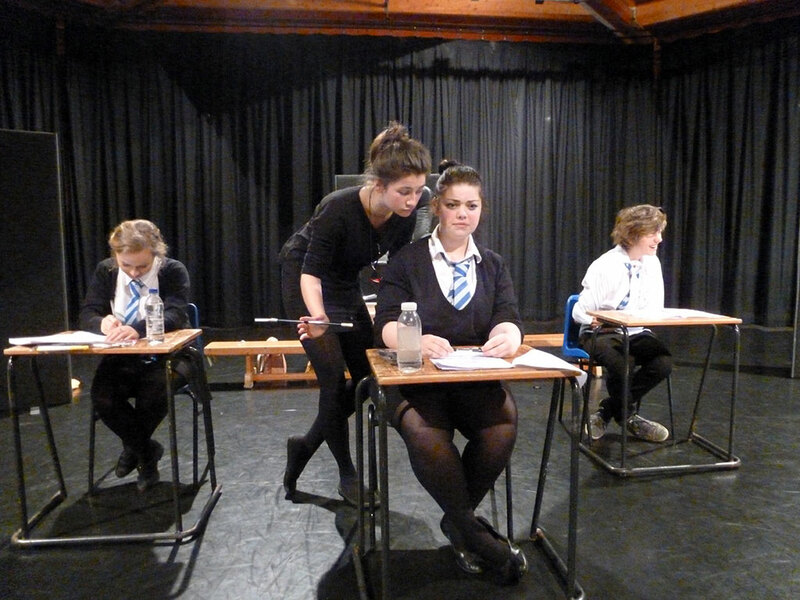 Some exam performance rehearsals take place after school and on the occasional weekend day over the two years. 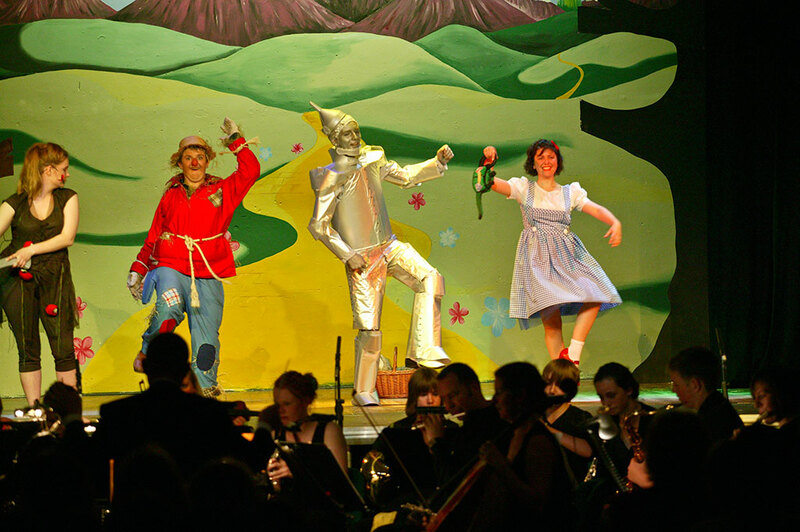 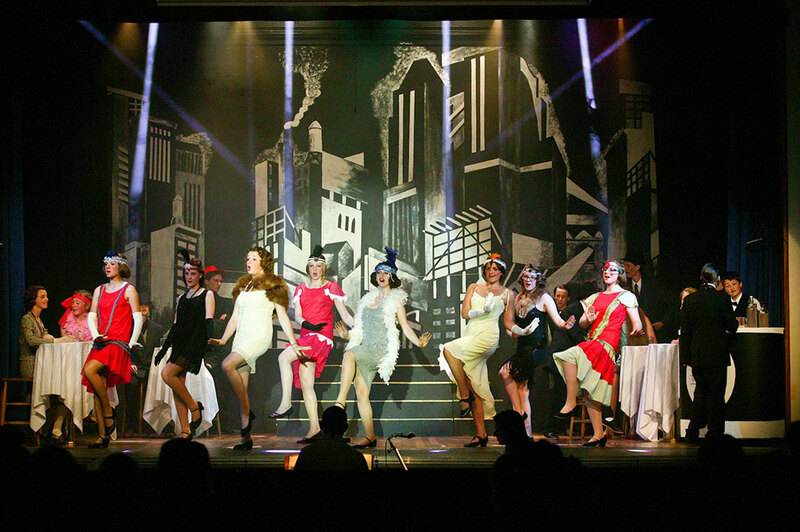 The course involves several theatre trips which students will be expected to attend. 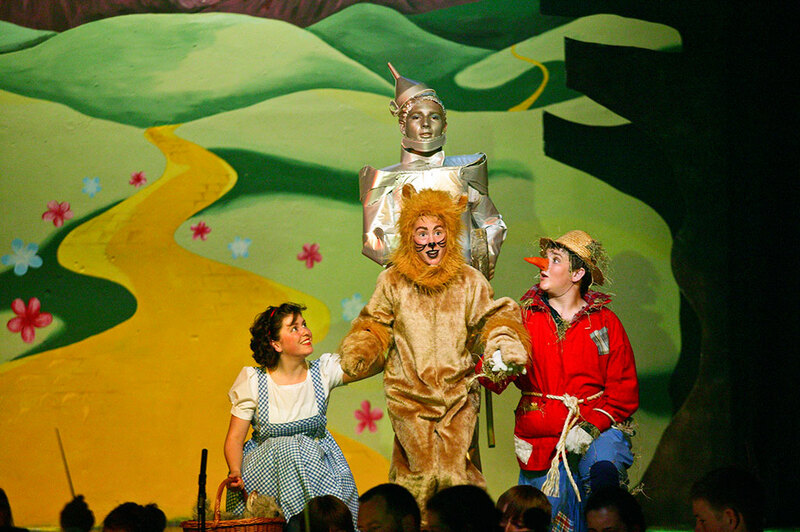 These trips are usually in the evening or on a Saturday. 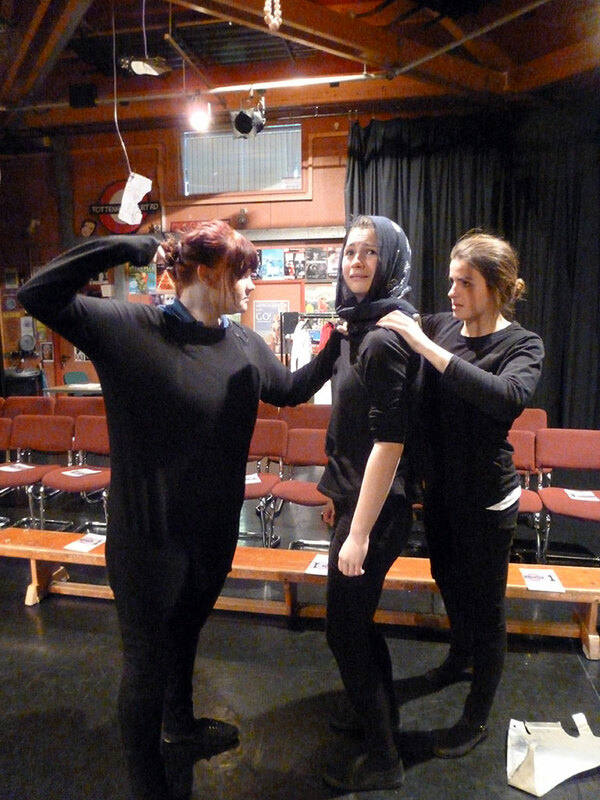 We like to think that as drama students, they will want to go to the theatre. 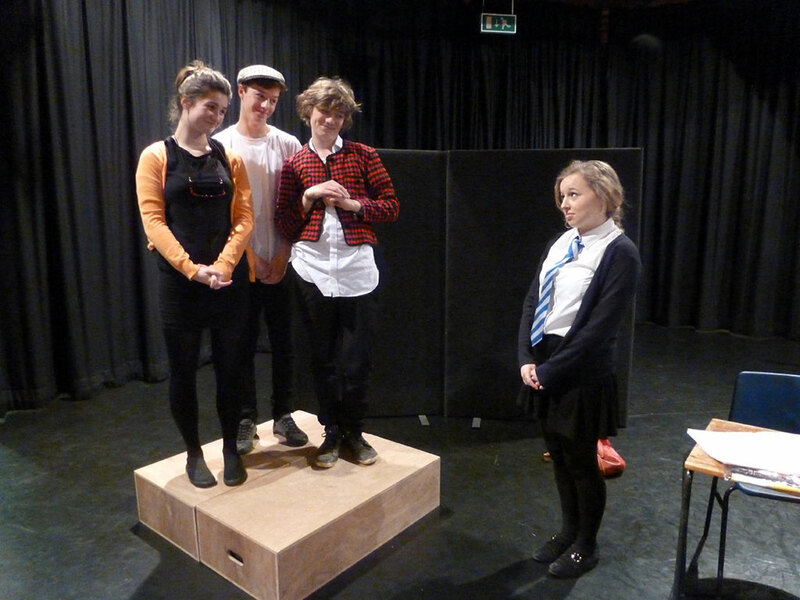 We continue using the Pearson exam board for our A’ level Drama and Theatre Studies. 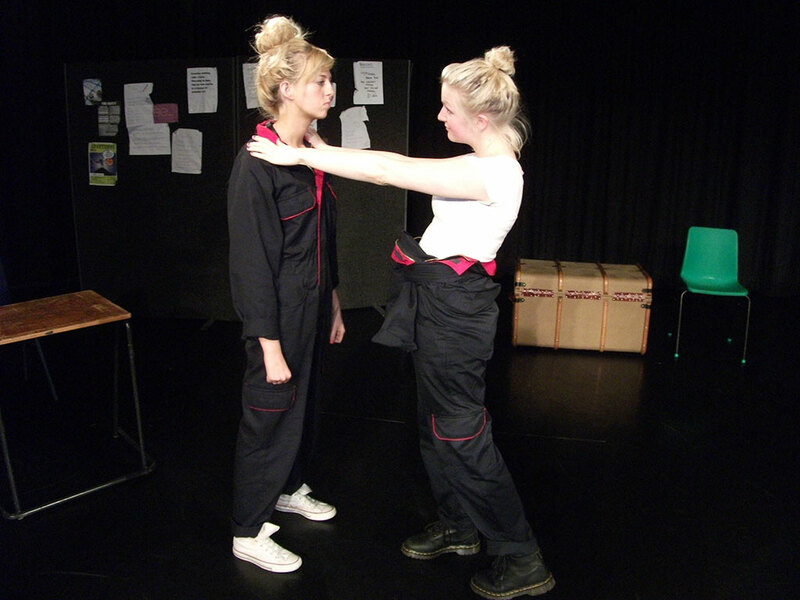 This course demands practical, creative and communication skills. 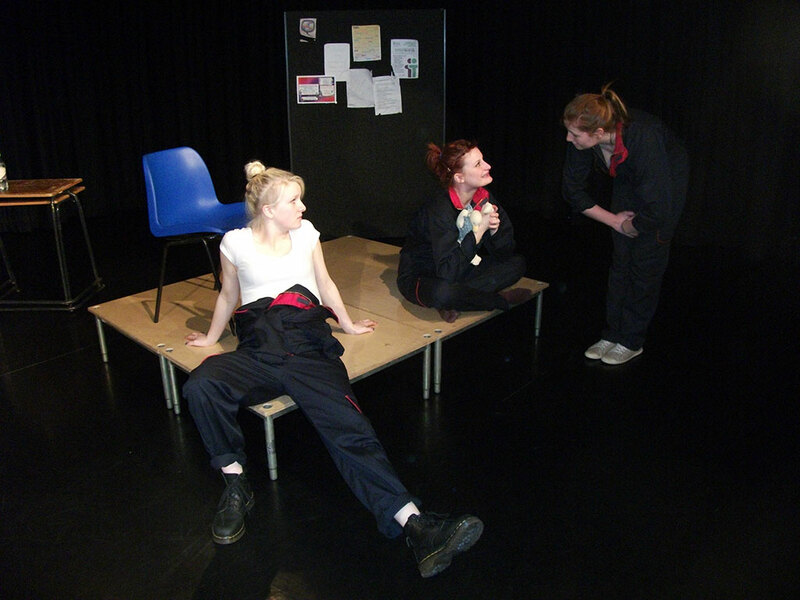 This is a rigorous A’ level where written and practical skills are needed and developed. 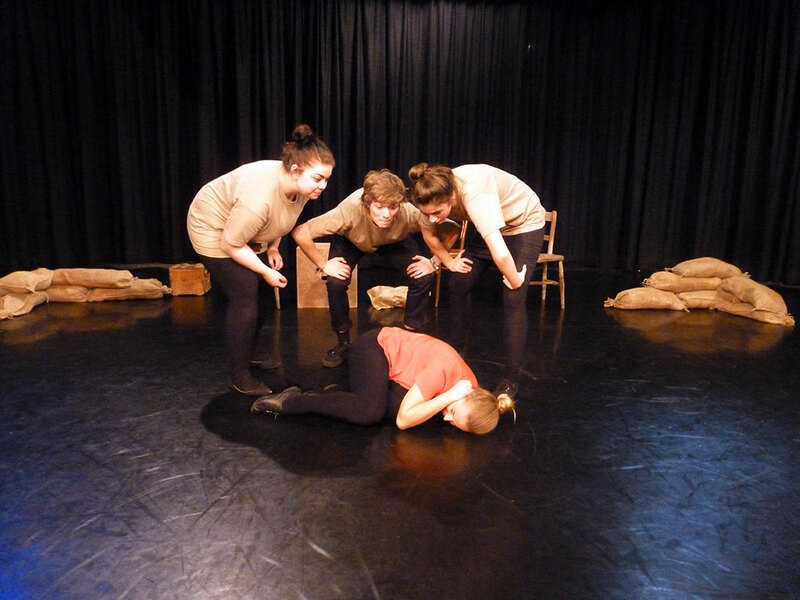 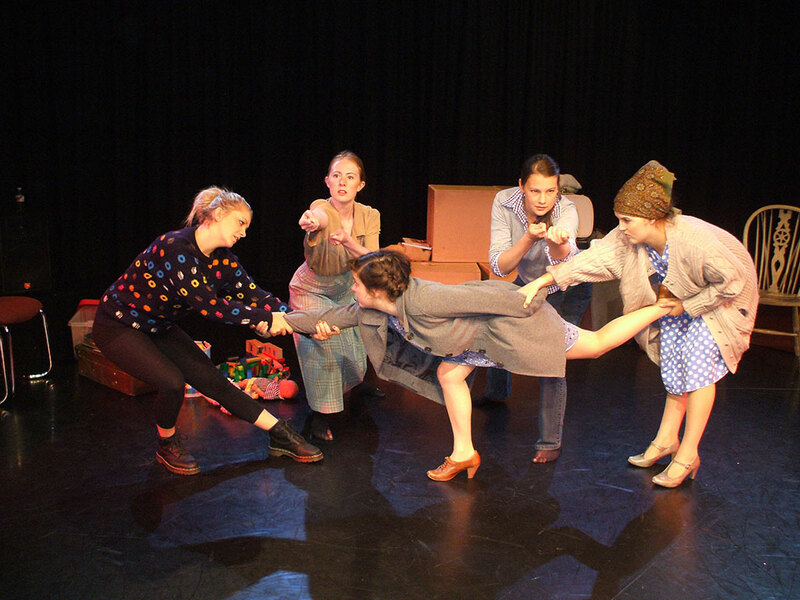 The course involves taking part in performances, devising and studying plays and playwrights. 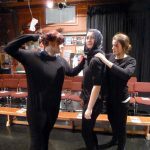 Currently we explore ‘Machinal’ by Sophie Treadwell, ‘The Threepenny Opera’ by Bertolt Brecht and ‘Antigone’ by Sophocles. 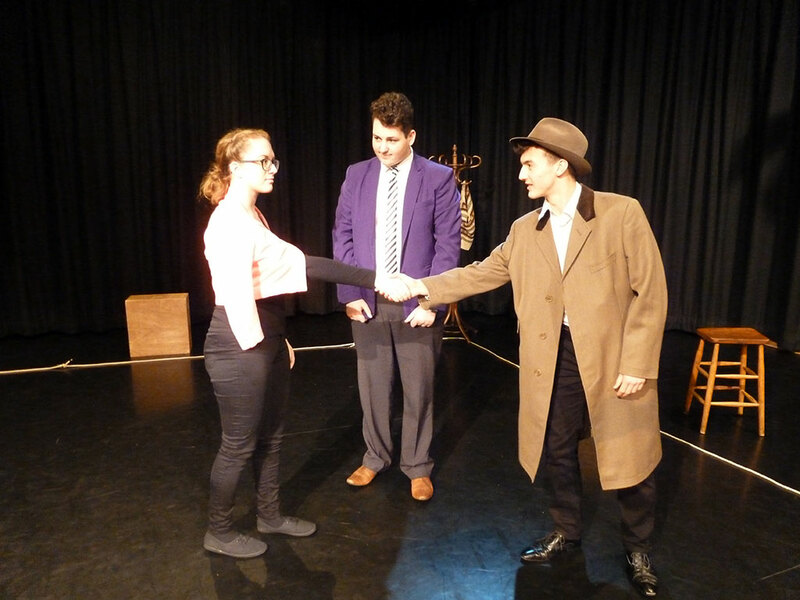 Regular visits to the theatre are essential, students are expected to become independent theatre goers. 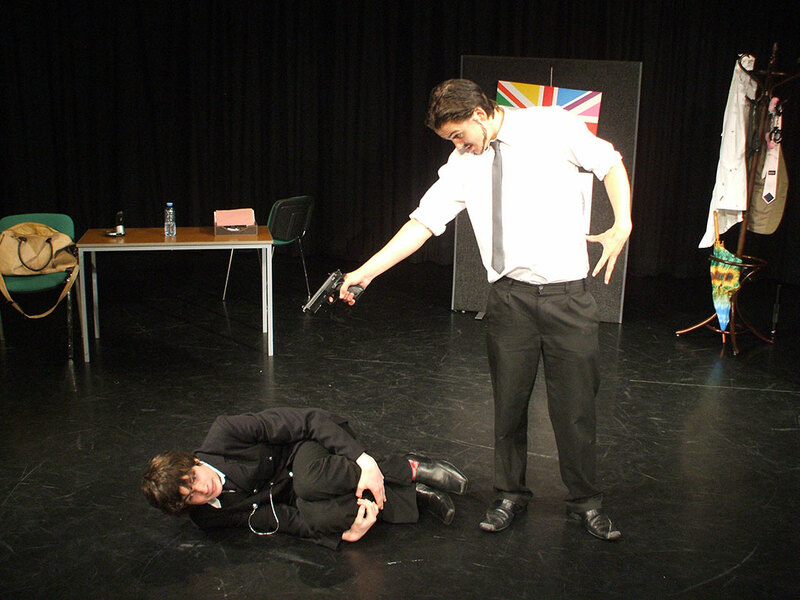 There is a written exam at the end of the second year that is worth 40% of the A’ level grade. 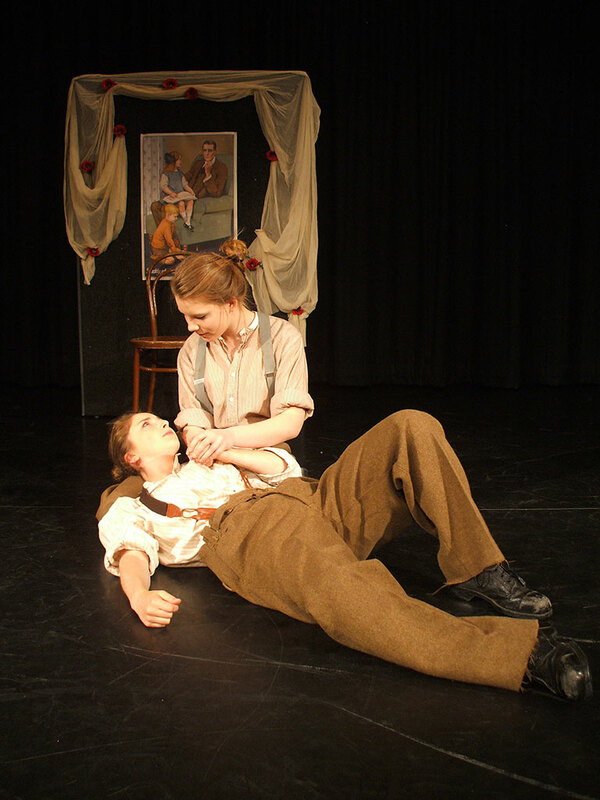 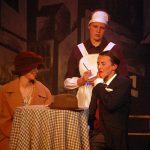 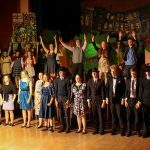 A’ level Drama can lead to further study in Drama, Theatre Studies and Performing Arts in Higher Education at Degree level. 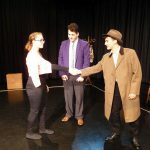 Many university courses in other subjects value applicants with A’ level drama as it reflects a high standard achieved in what are sometimes called ‘employability skills’ also referred to as ‘soft skills’. 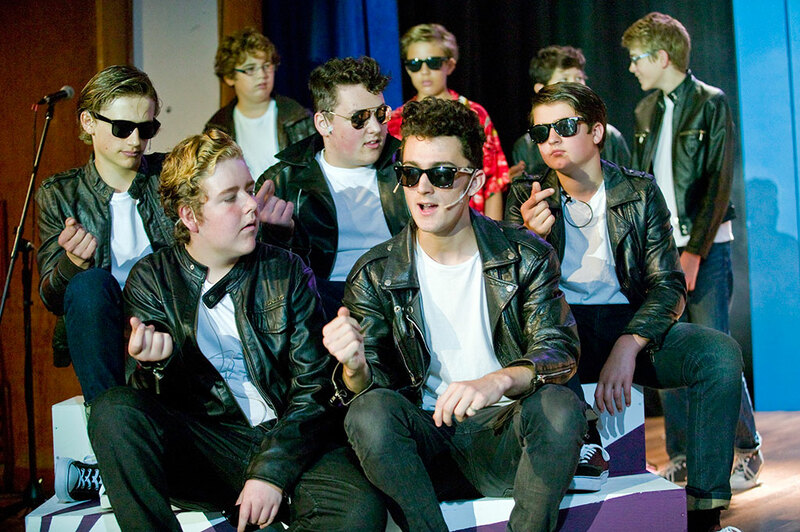 Rehearsals for exam work will sometimes take place at weekends and during holidays, these are always arranged through negotiation with the group. 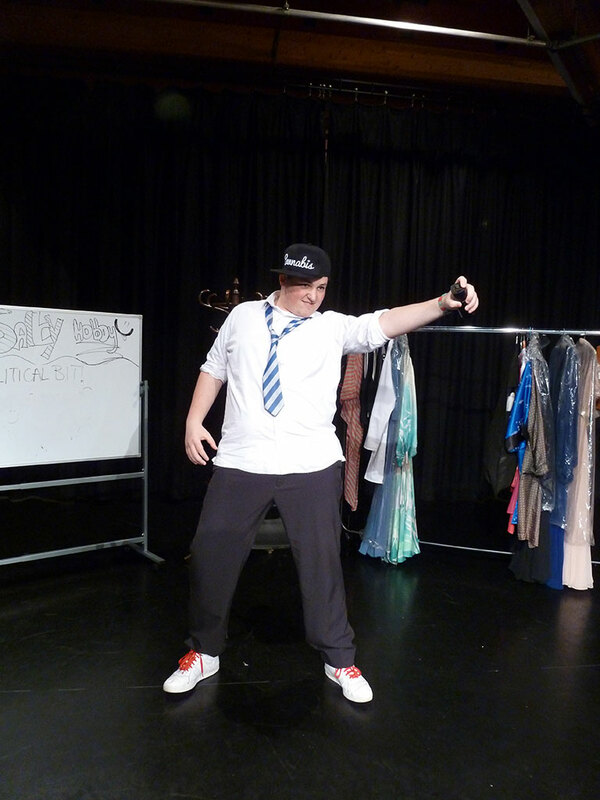 Recently we had a student who went on to train as an actor/musician at Rose Bruford drama school and is currently in a UK tour of ‘Buddy’. 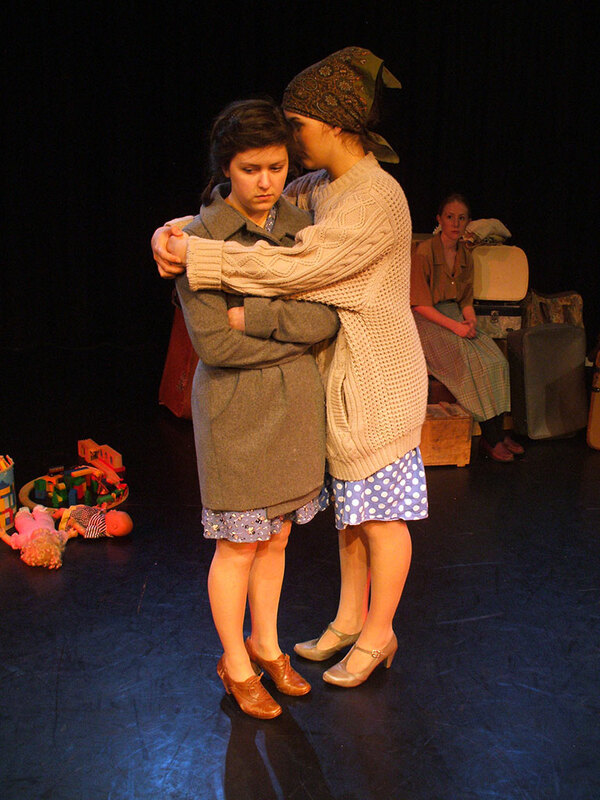 Another one of our successes has recently been in ‘Gypsy’ with Imelda Staunton in the West End. 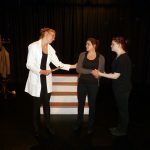 We also have a student working for a television company (Outdoor Productions) as a Researcher and Production Coordinator. 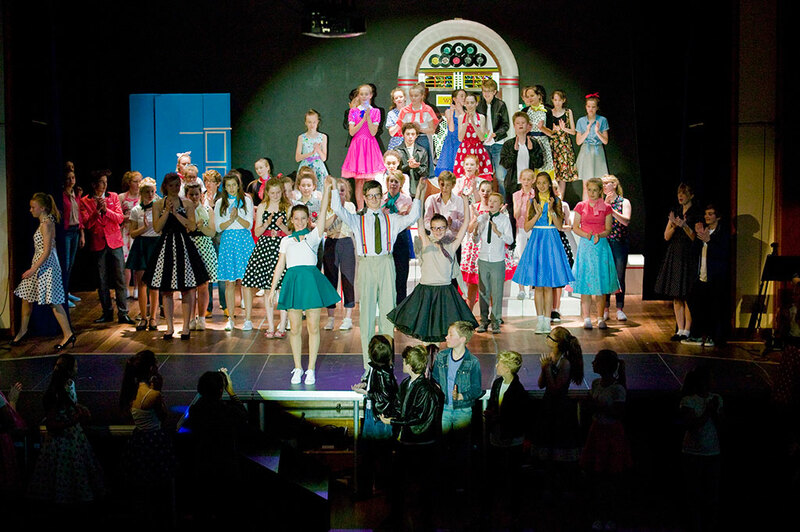 We put on a big whole school musical every other year. 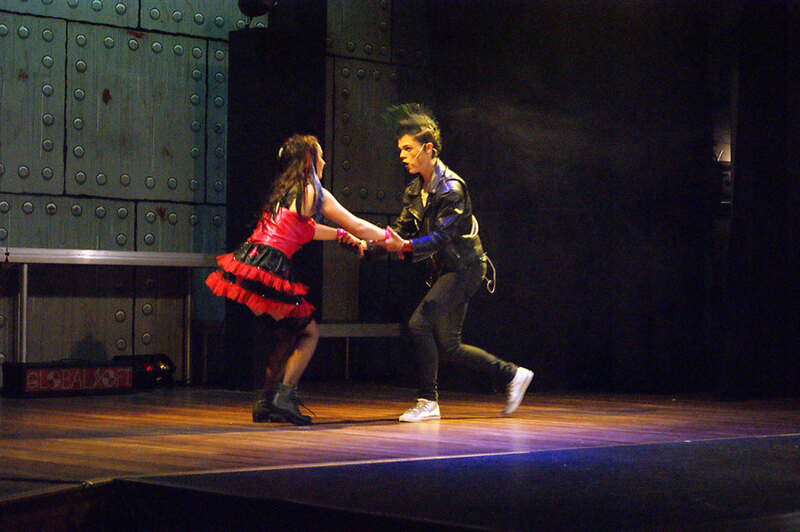 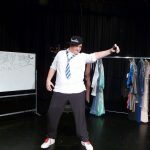 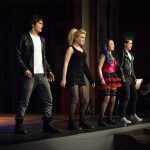 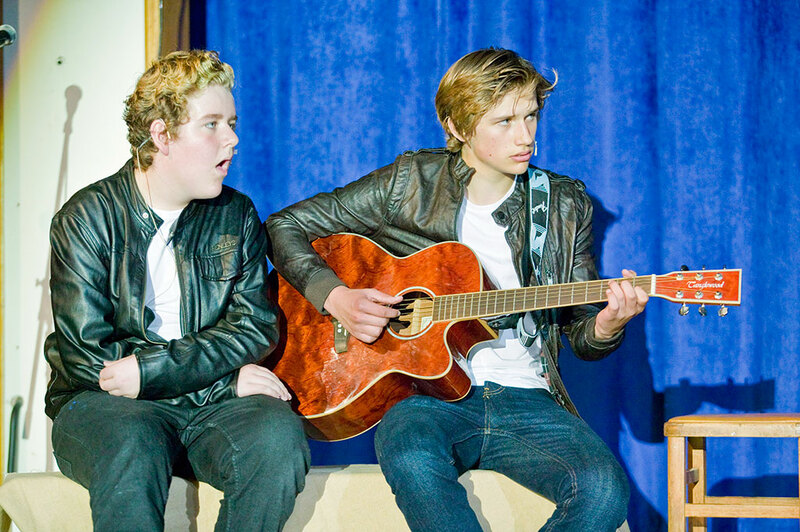 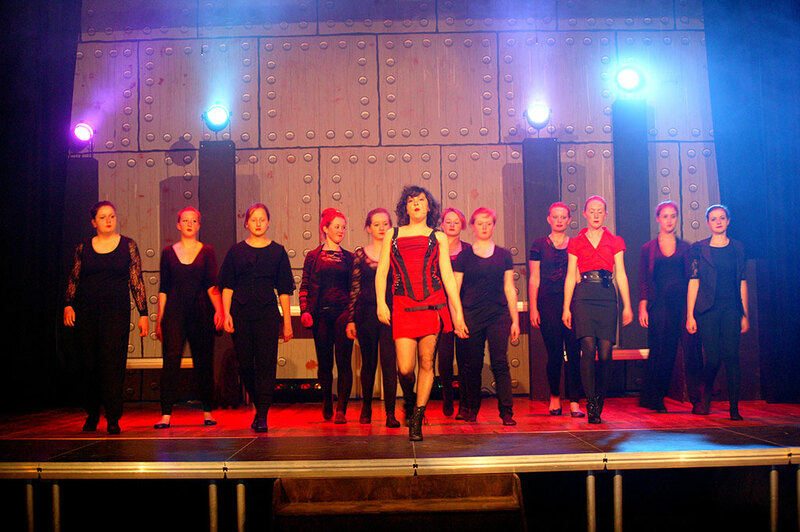 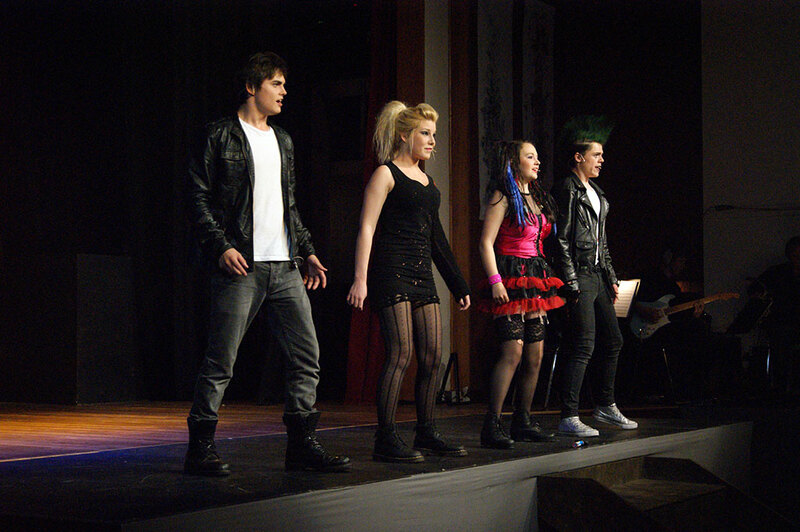 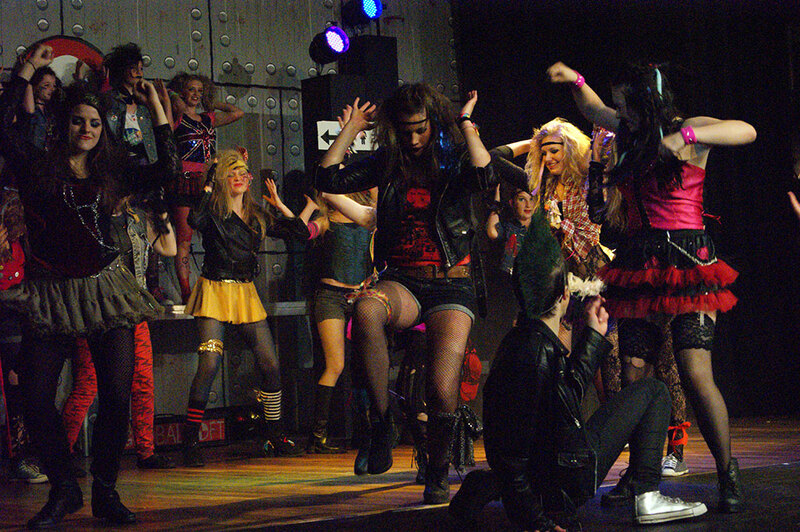 This year our school production is ‘School of Rock’. 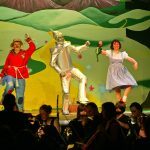 Rehearsals start in January 2019 and go on until the performance week. 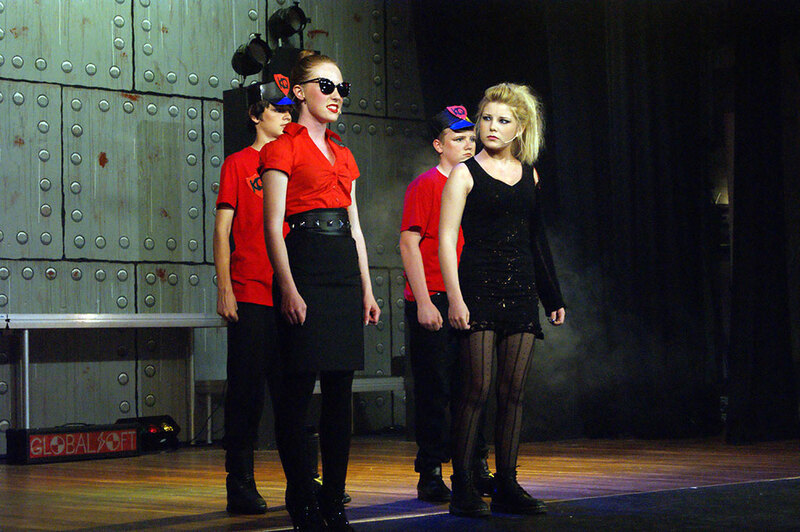 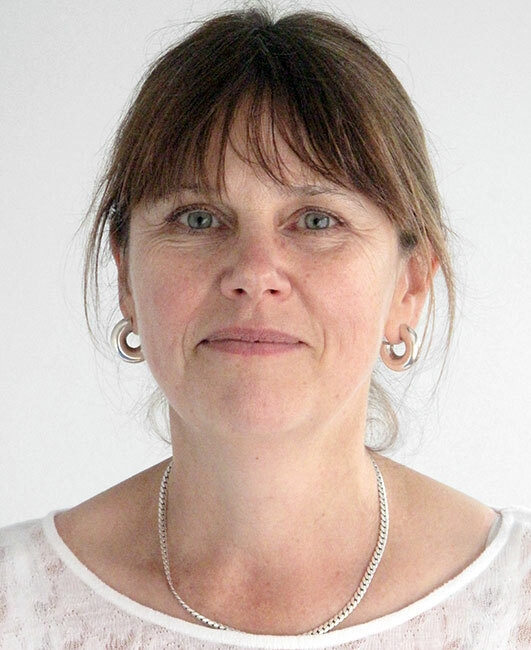 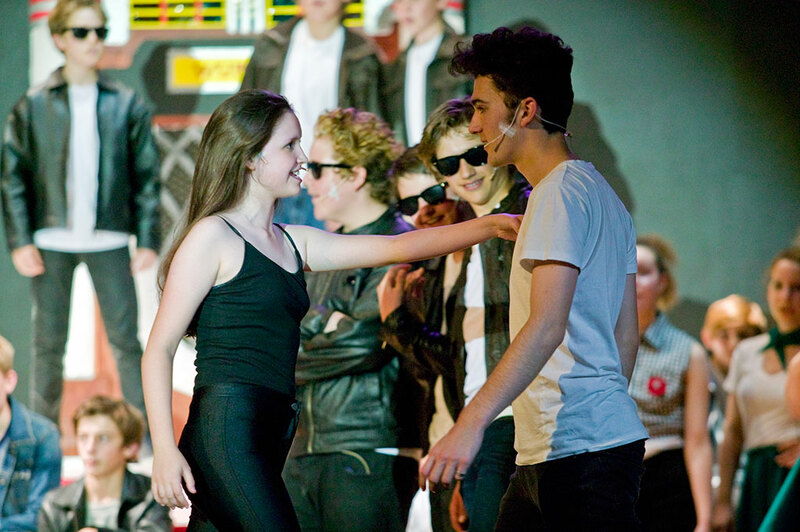 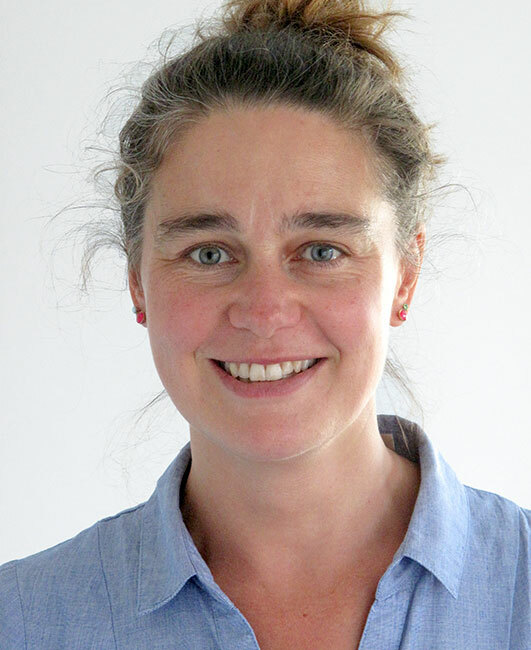 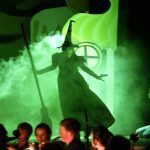 If you have any queries please email Ms Cruwys-Finnigan, Head of Drama on acruwys-finnigan@woodroffe.dorset.sch.uk.